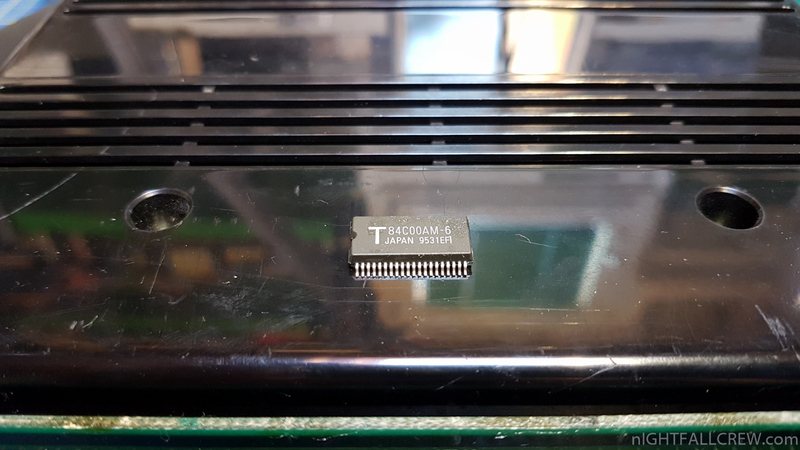 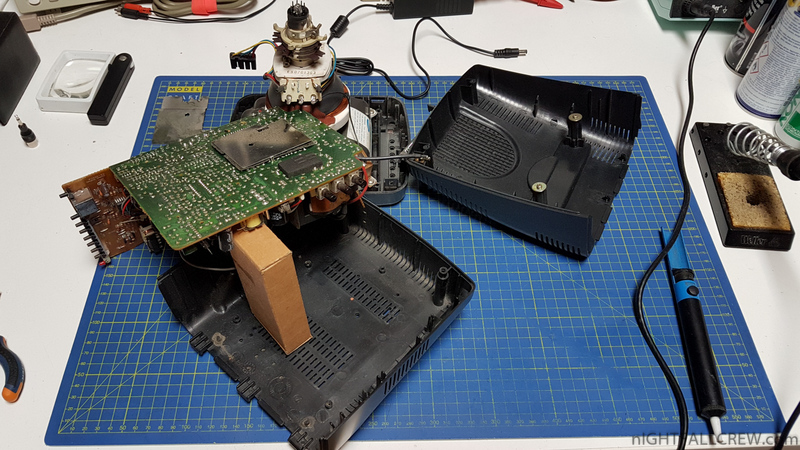 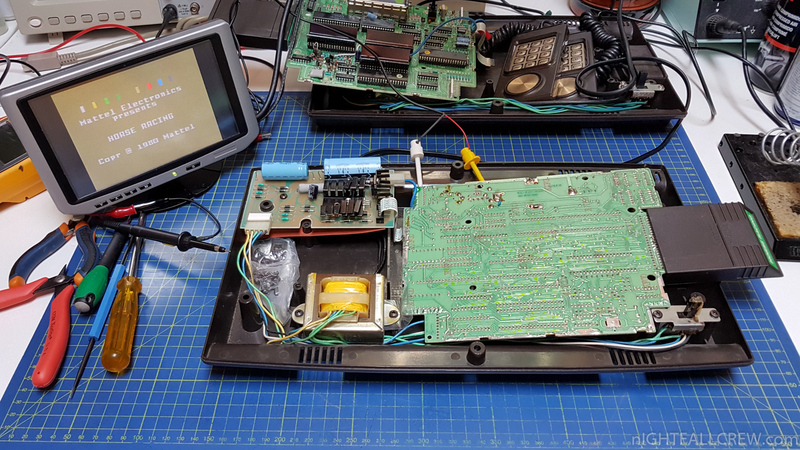 SNK Neo Geo MV1a Z-80 Error Repair. 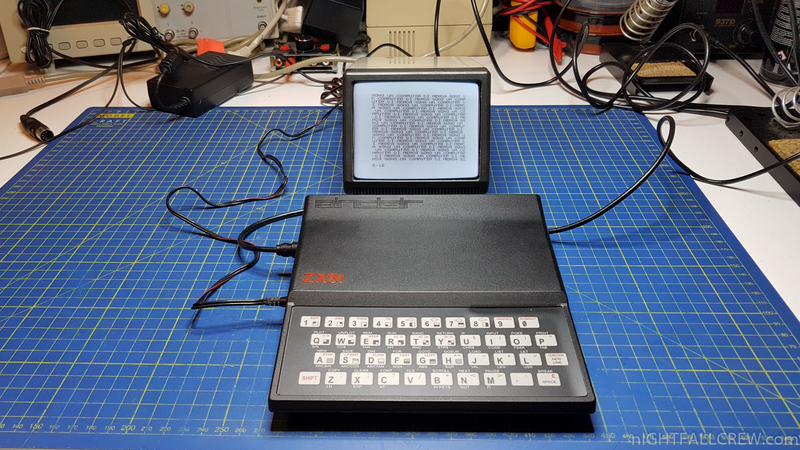 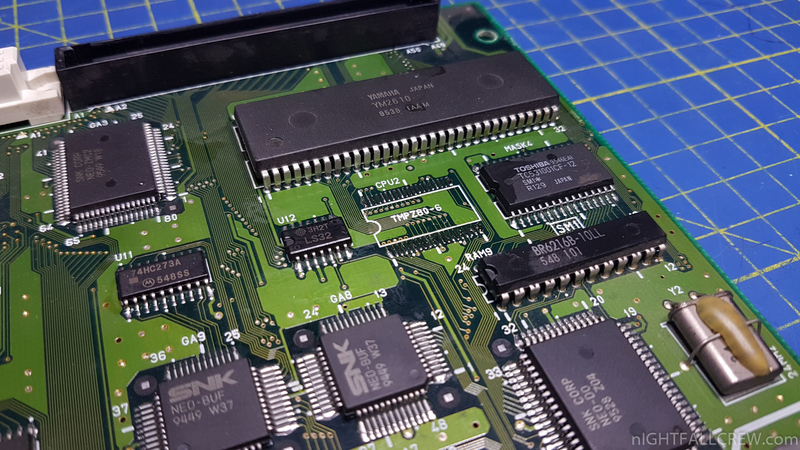 Replacement of the Z-80 CPU in PSOP40 format. 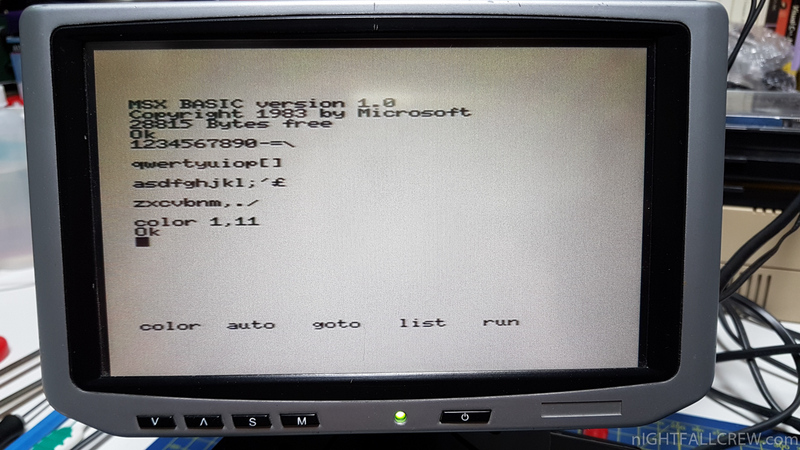 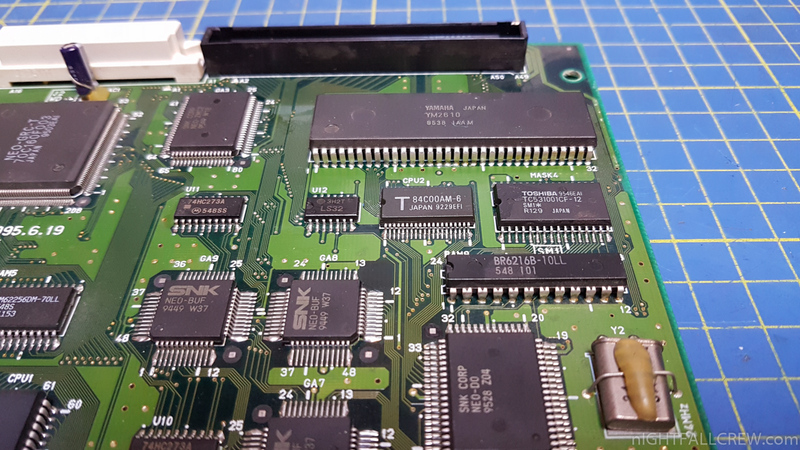 The error message “Z-80 Error” means everything and nothing, may be faulty the Z-80, SNK MASK-ROM SM1*, SNK NEO-D0 or also the YAMAHA YM2610. 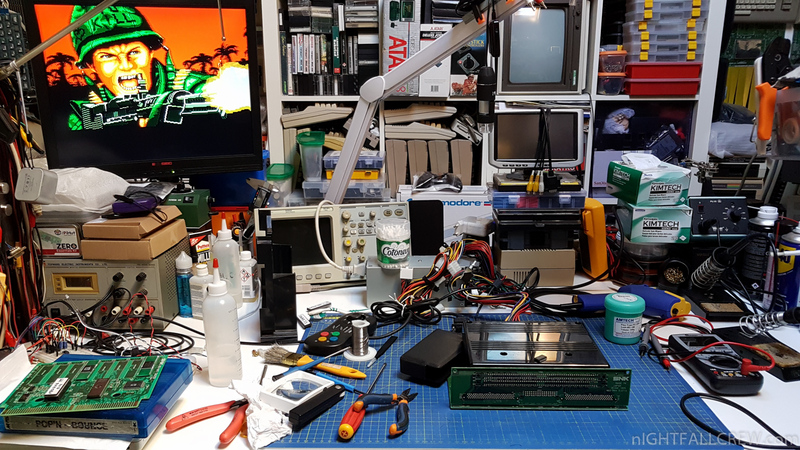 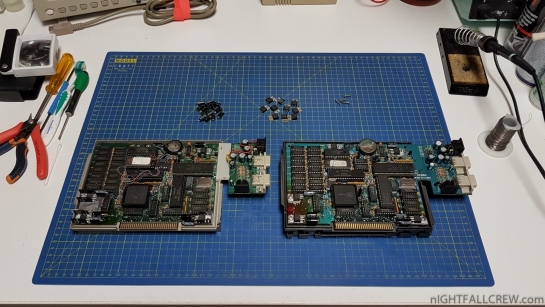 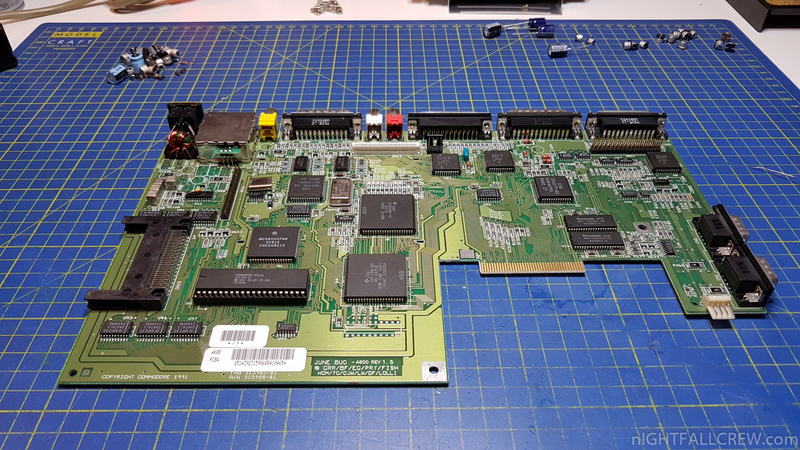 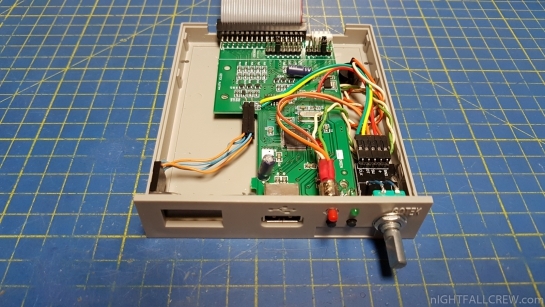 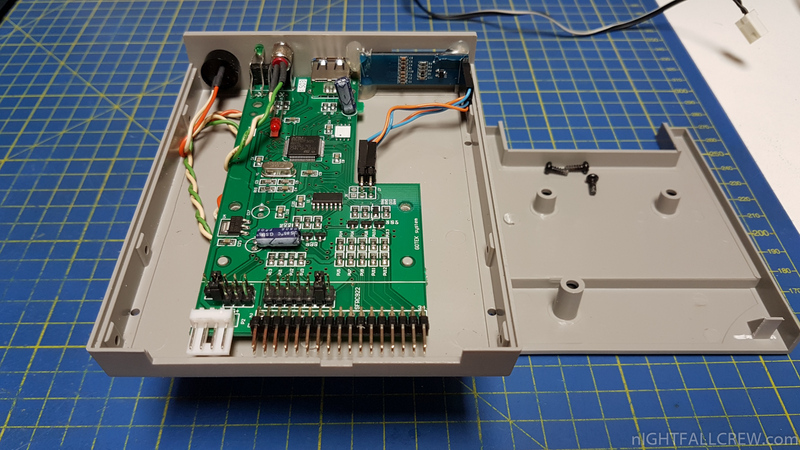 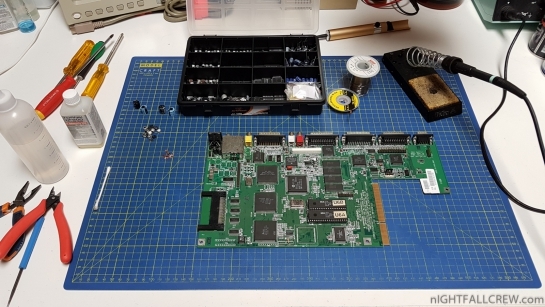 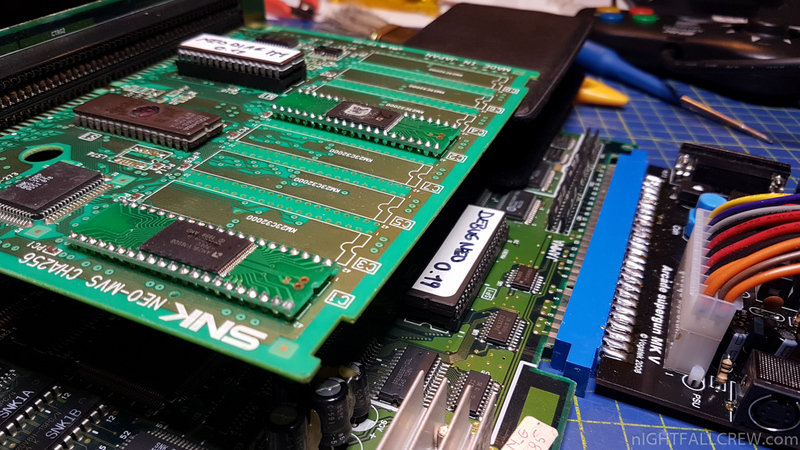 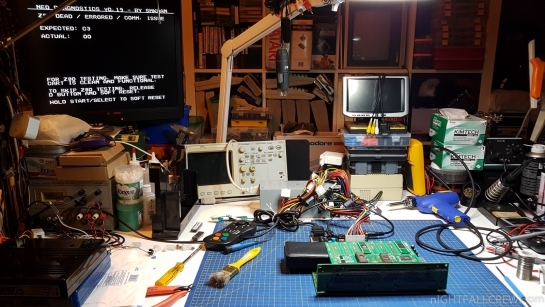 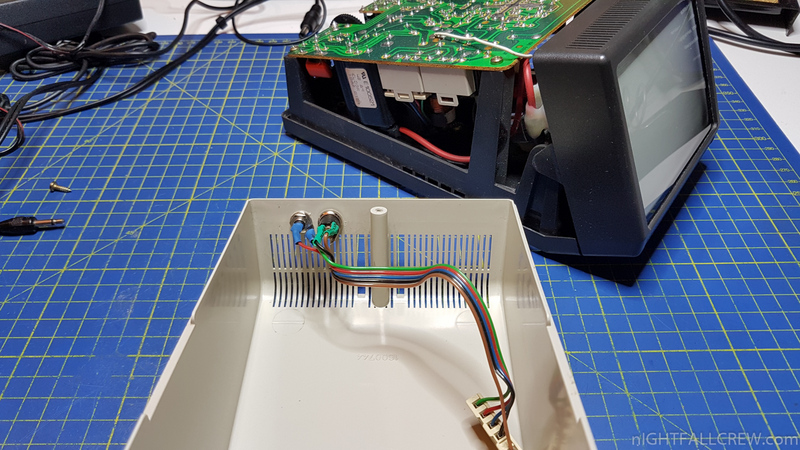 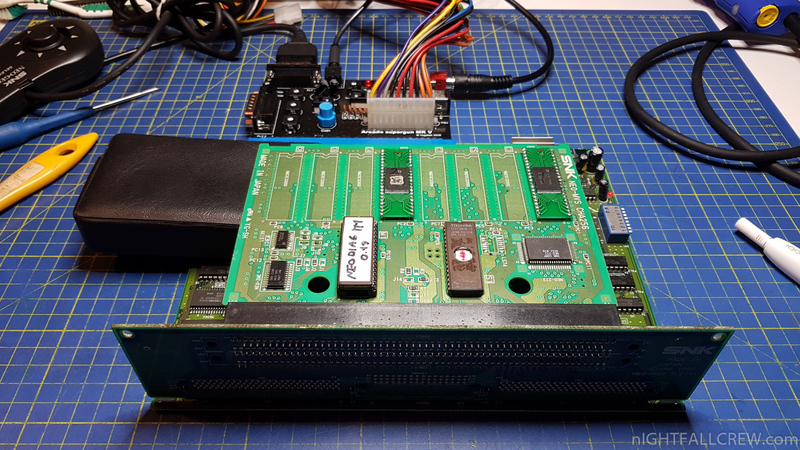 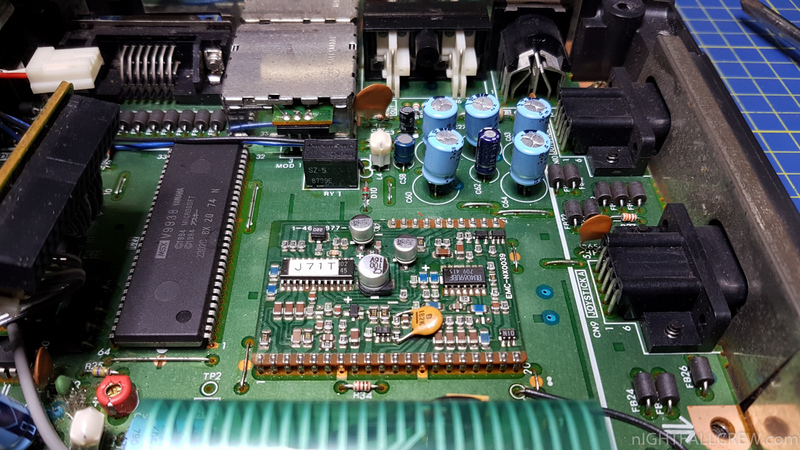 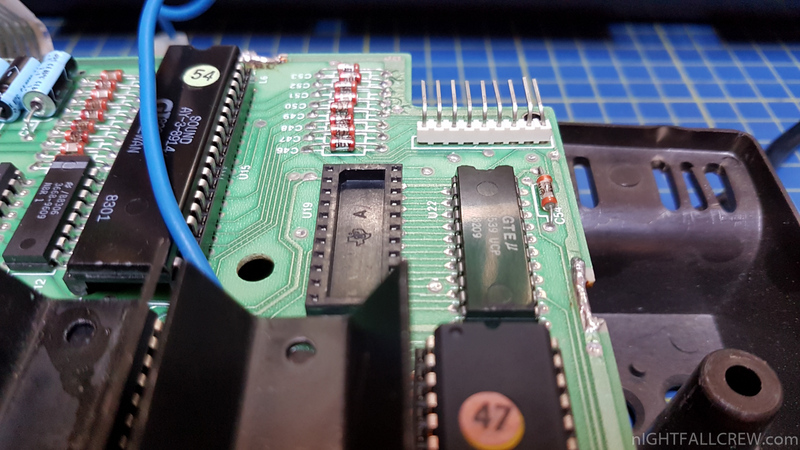 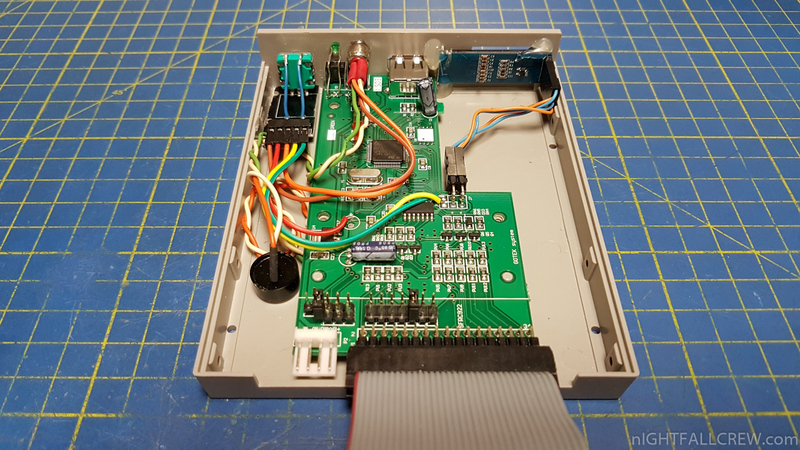 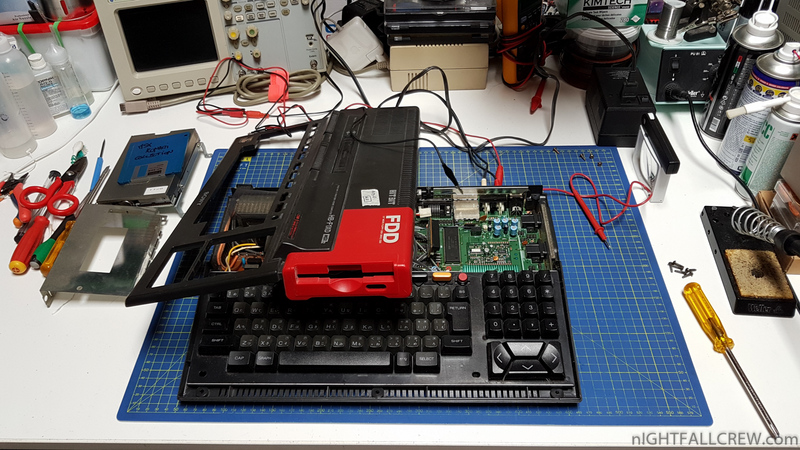 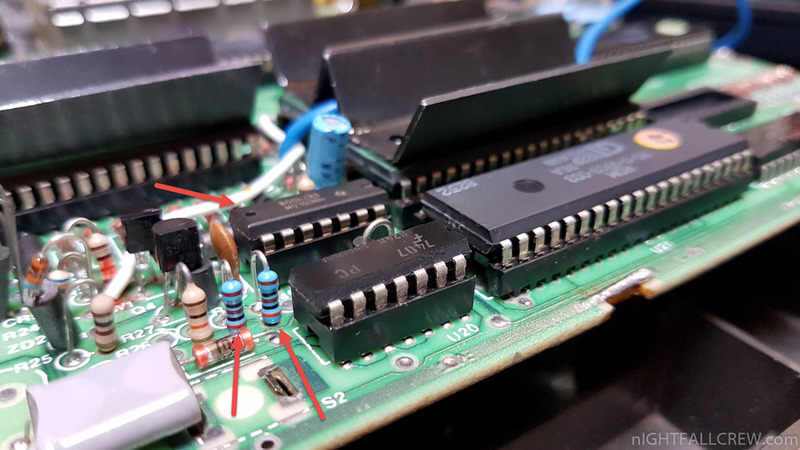 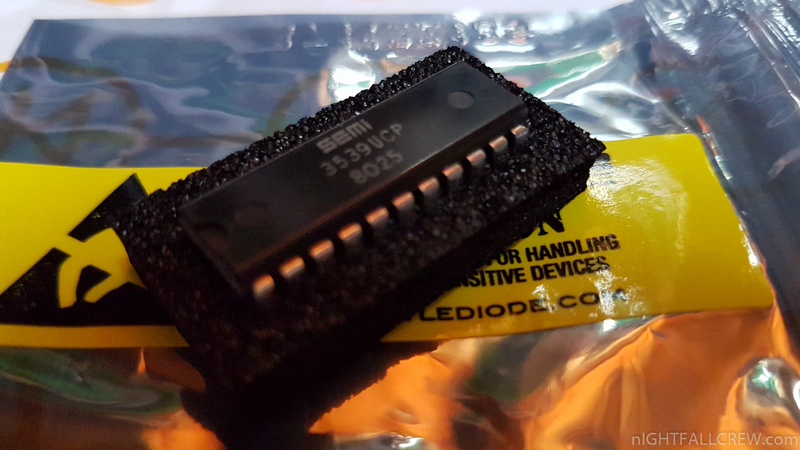 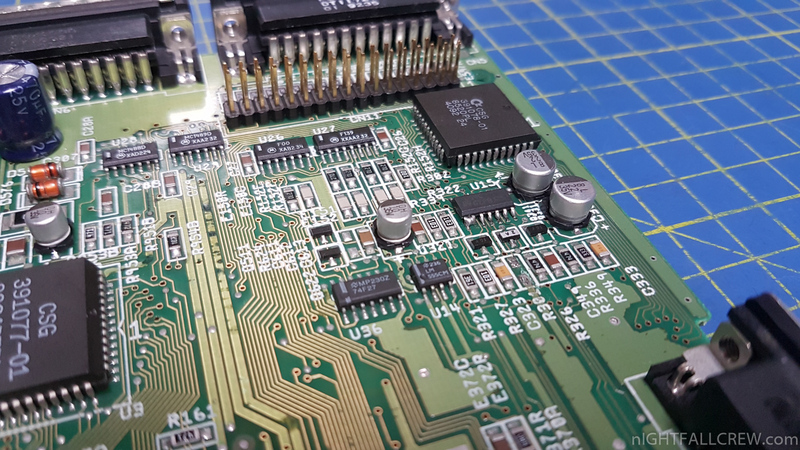 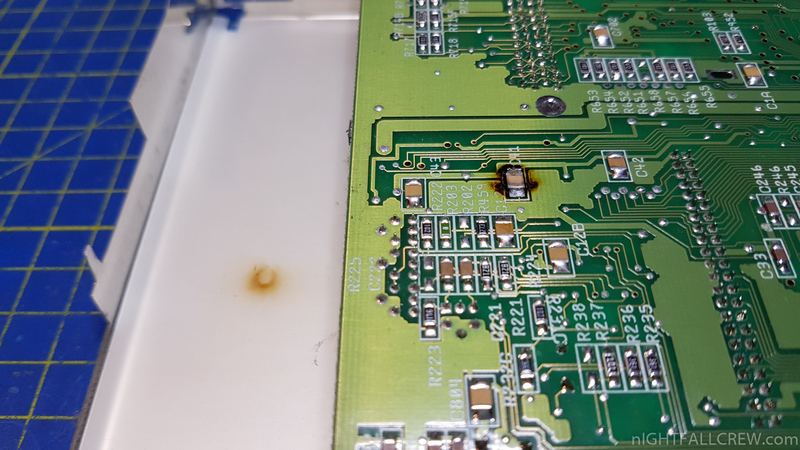 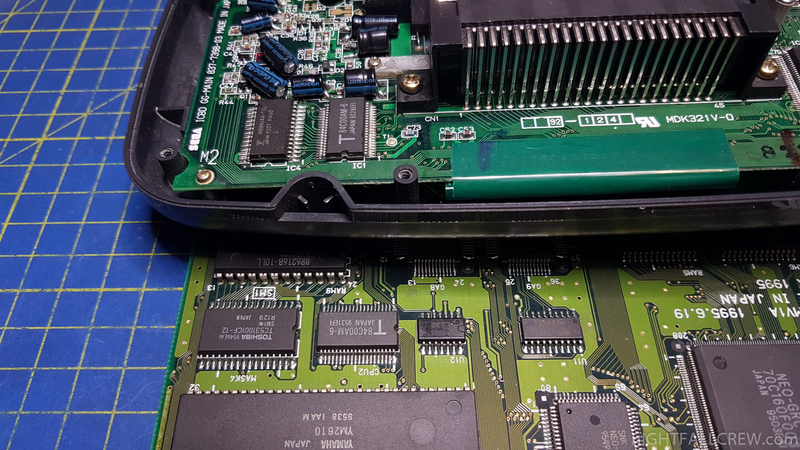 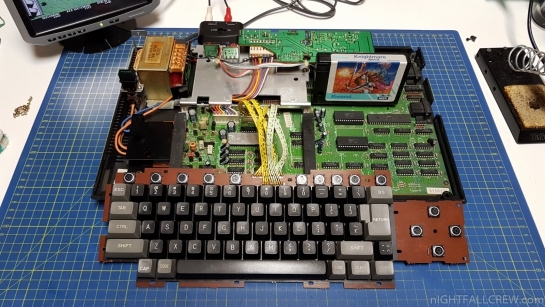 With the Neo Diagnostics bios and with the M1 ROM burned and installed on the CHA Board of any NEO GEO cartridge, the problem can be better identified. 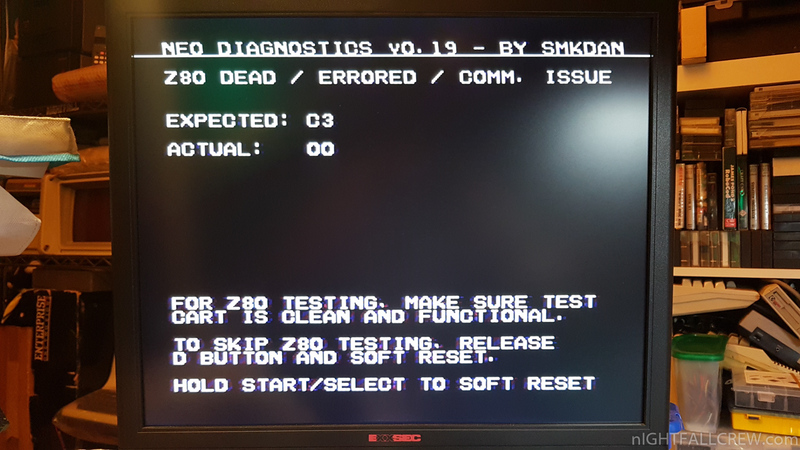 It is said that the error C3/00 that you see in the photos of NEO DIAGNOSTICS (write: C3 but reads: 00) is an almost assured a CPU problem, in fact, in this case it was. 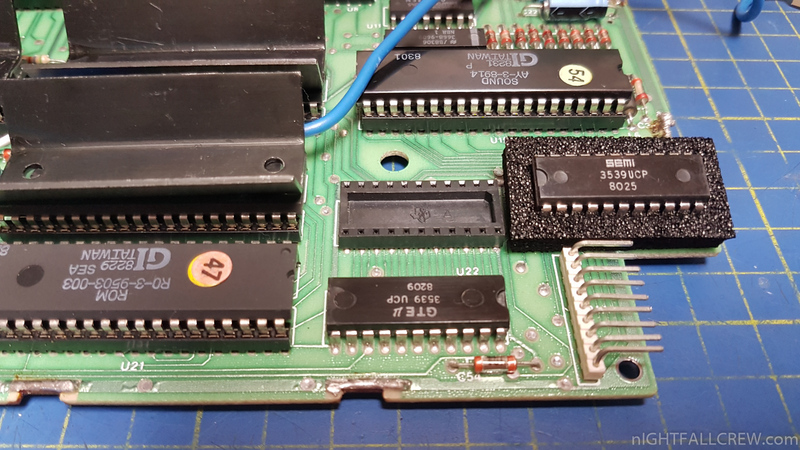 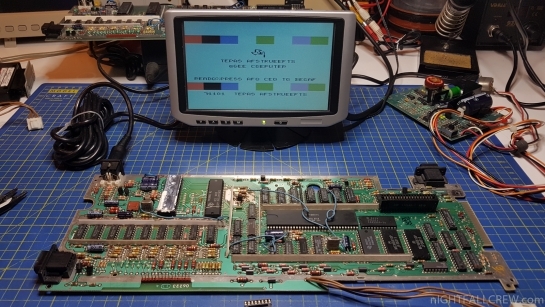 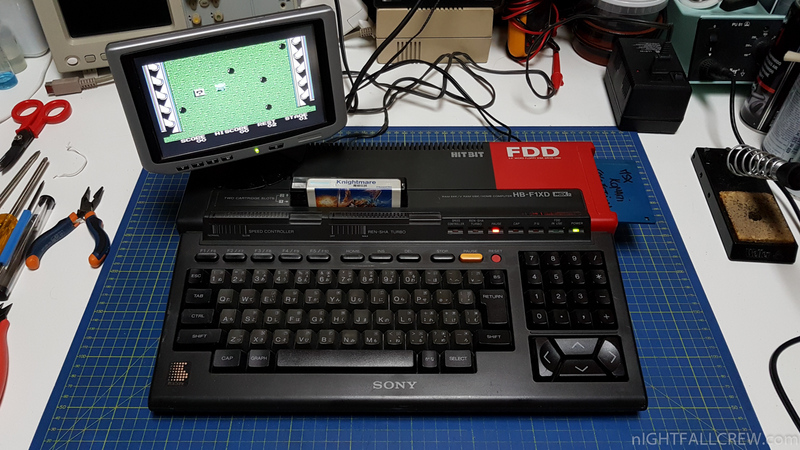 The Z-80 CPU in PSOP40 format has been recovered from a failed SEGA GameGear. Black Screen and deafening sound in background. 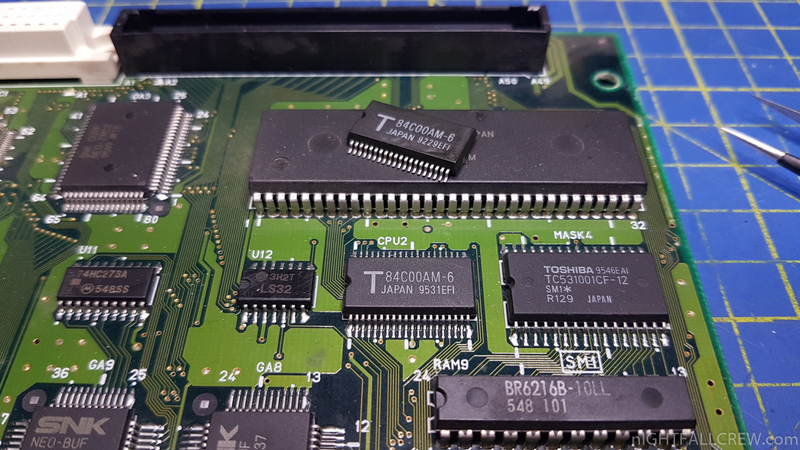 1 x TMS4116-20 RAM (U103). 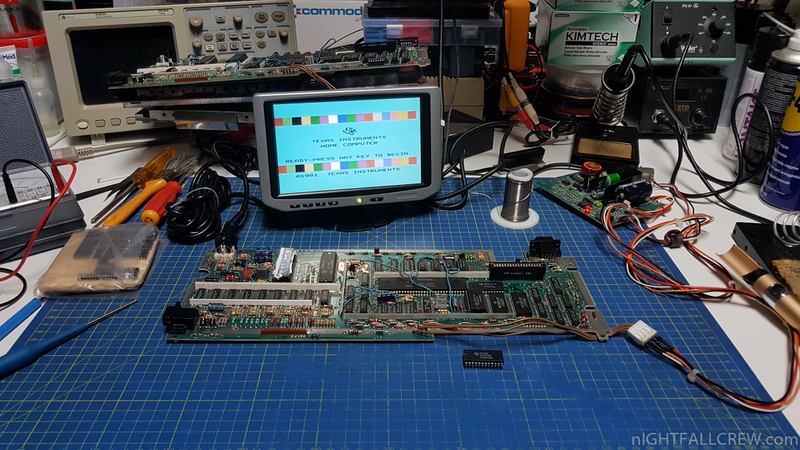 This Commodore Amiga 600 is arrived in laboratory in immaculate state still with the warranty sticker. 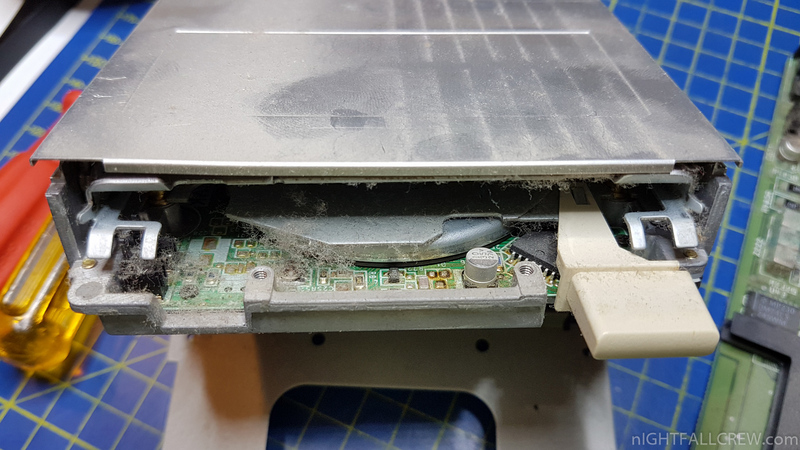 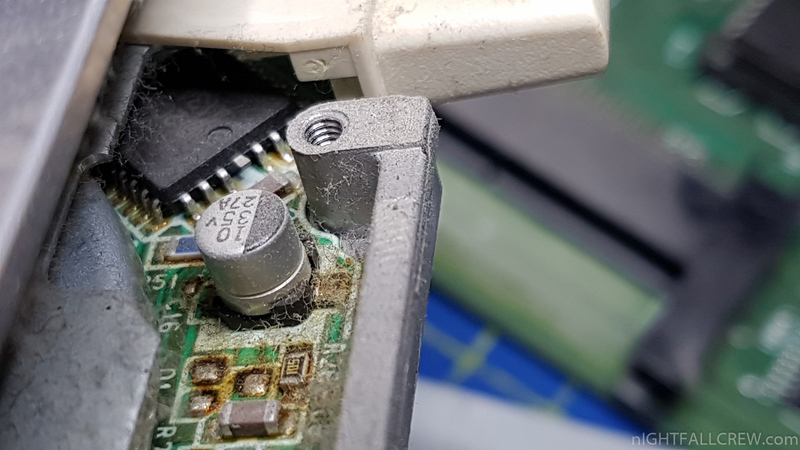 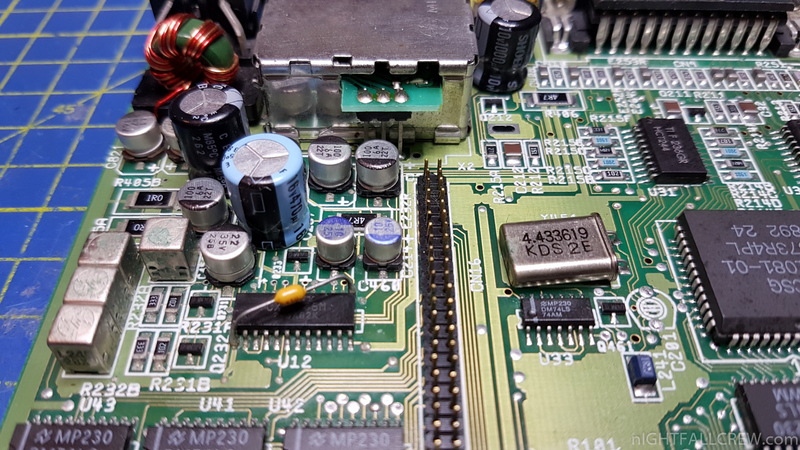 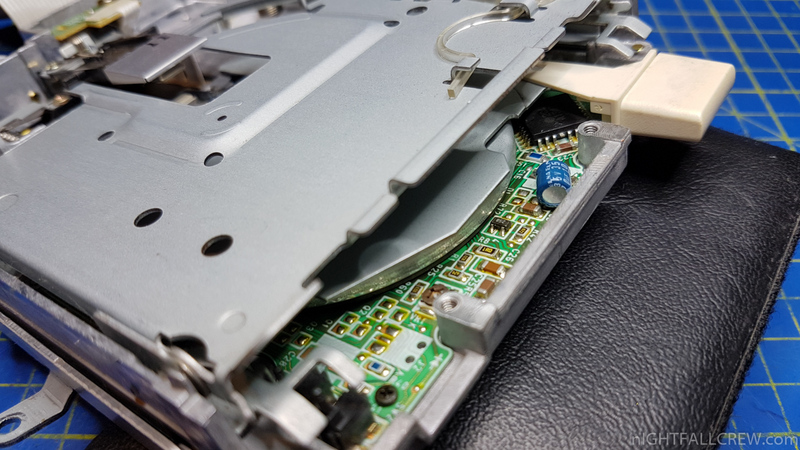 Immediately after the disassembly i have immediately noticed that were are several problems of acid released from the capacitors and dirty that affected this poor Amiga 600 and its Floppy Drive. 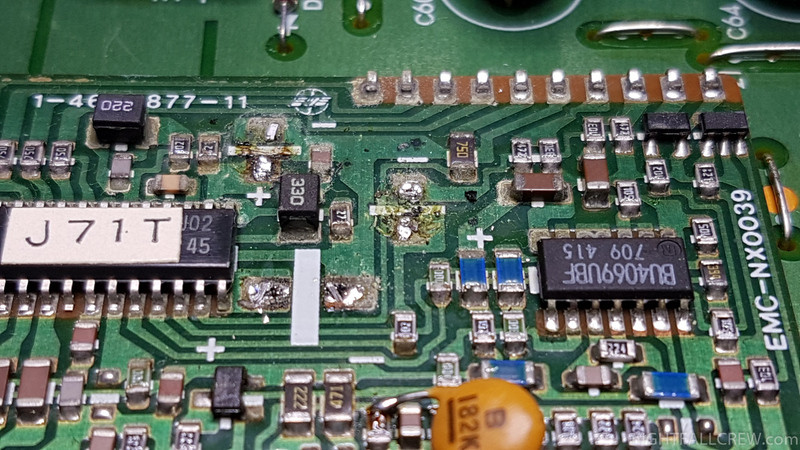 A decoupling capacitor it’s exploded with a pit on the PCB side, solved this problem i started to replace all the electrolytic capacitors and to clean the pcb with specific products. 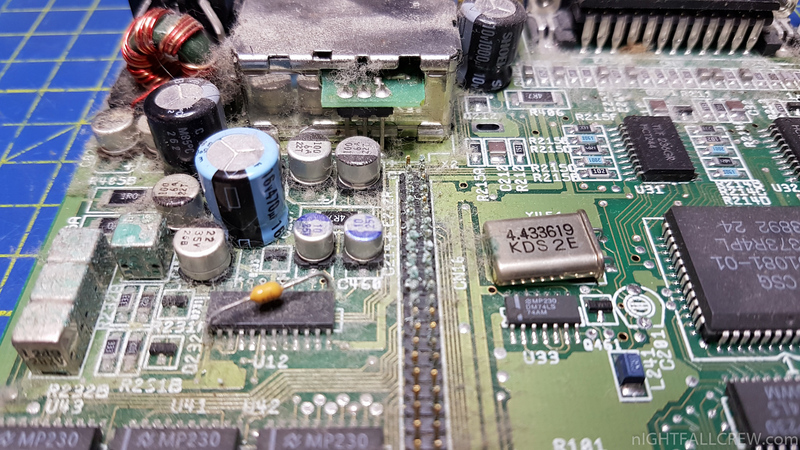 After the replacement of the electrolytic capacitors, i have tried to turn on the amiga that apparently worked, shame about the distorted sound and the floppy drive that read 1 time of 100. 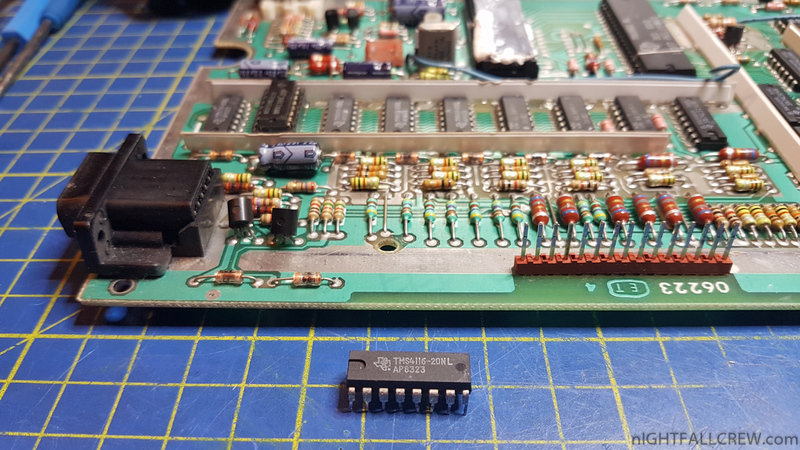 I had to replace the electrolyte capacitor on the Floppy Drive and soon after i looked for the fault of the audio problem that 99% is always the usual LF374. 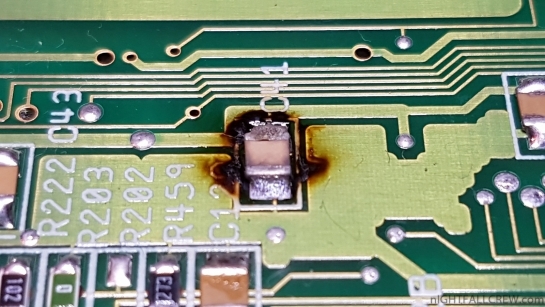 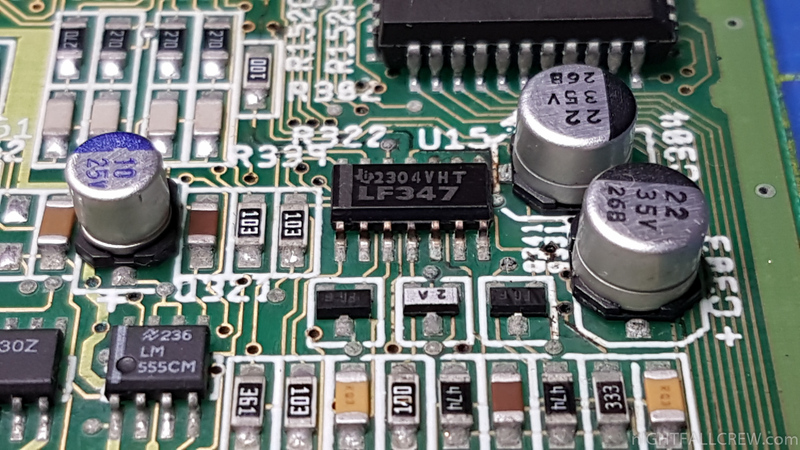 In this case it was not only LF374 but also a 10ohm resistor that did not let the +12v to the LF374 and a short-circuited ceramic decoupling capacitor. 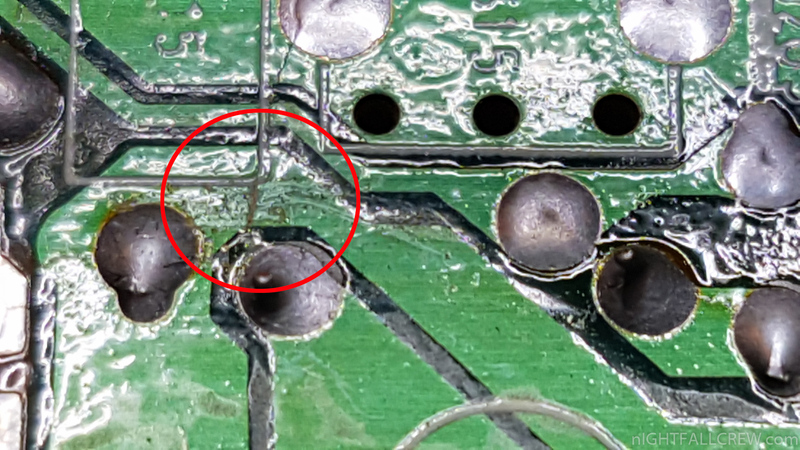 Unfortunately the welding of the LF374 did not come very well how i like to do it but the pad are destroyed and corroded by the acid and they were about to detach, indeed the pad of the pin 2 of the LF374 was really detached, that’s why the pin 1 and 2 of the IC LF374 are connected together, they were connected via the pad. 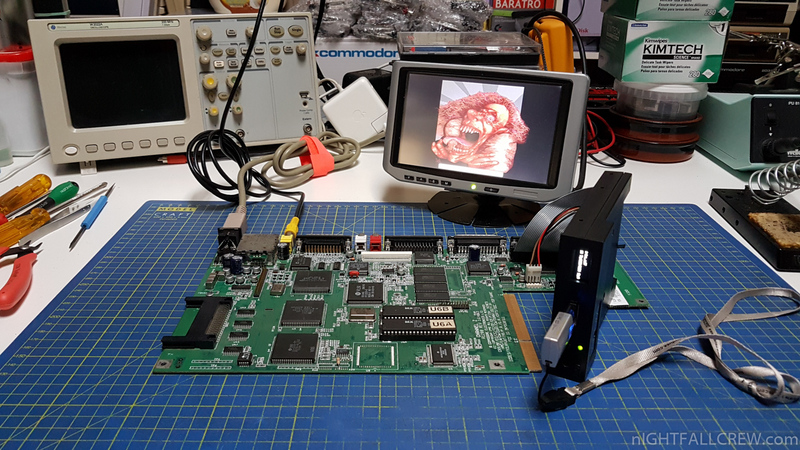 I leave you to the photos and the video. 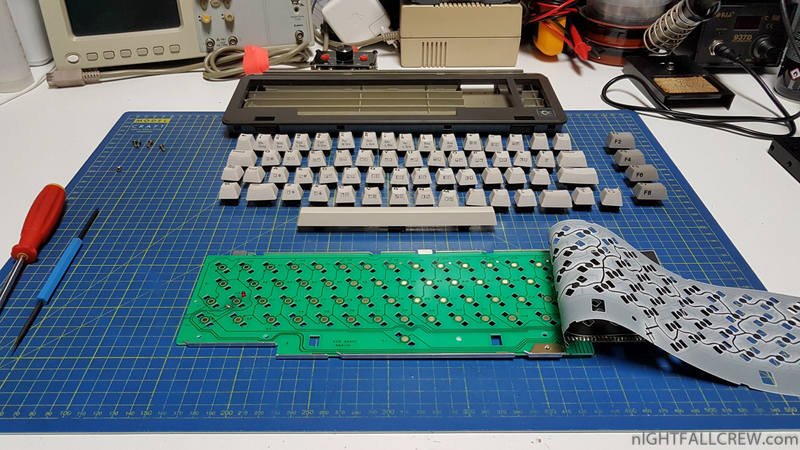 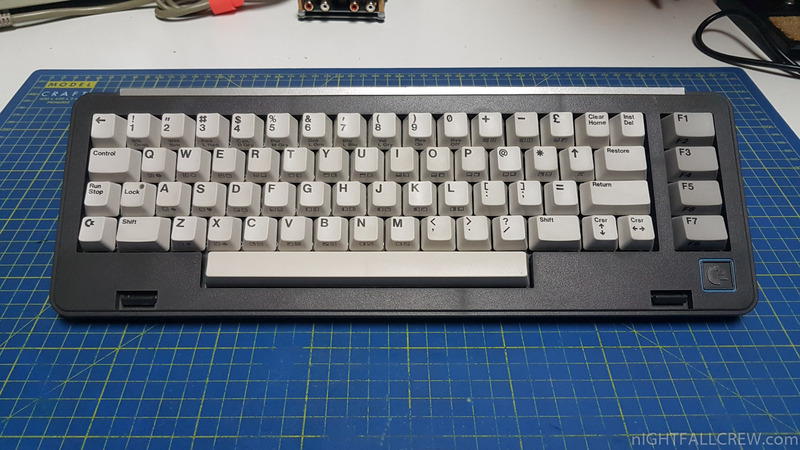 The Commodore-SX64 keyboard after some time isnt’t responding anymore (all or some keys). 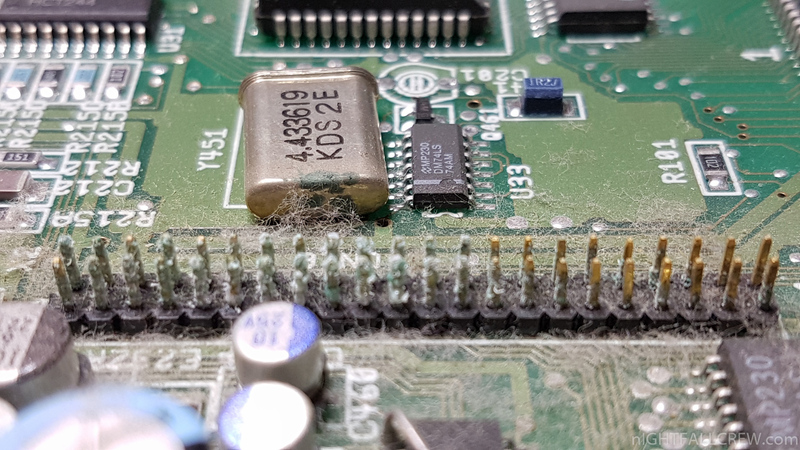 In this case, the keyboard needs some cleaning and repair. 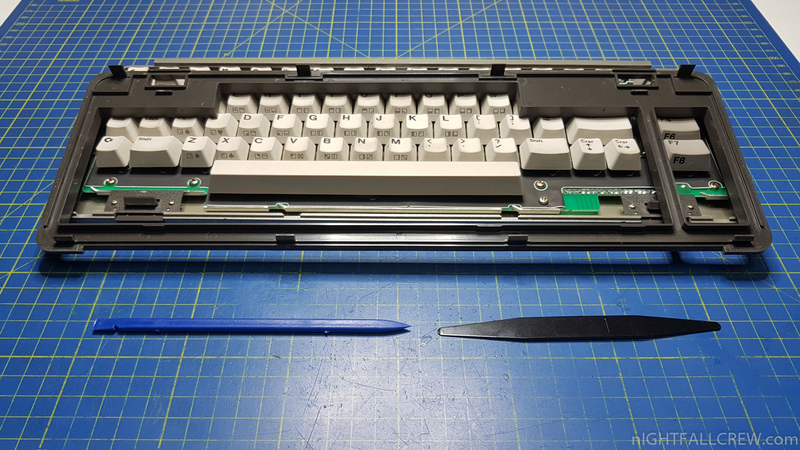 First of all you have to disassembly the keyboard housing, pay particular attention to the screws, this plastic is very old and not of a good quality, it breaks only if you look it. 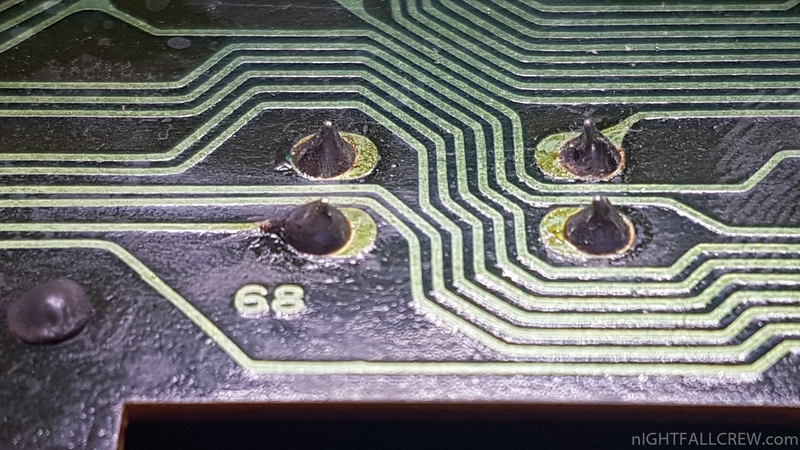 Gently remove the membrane and clean with alcohol all the metal contacts on the keyboard pcb and also clean all the contact pads on the membrane without alcohol. 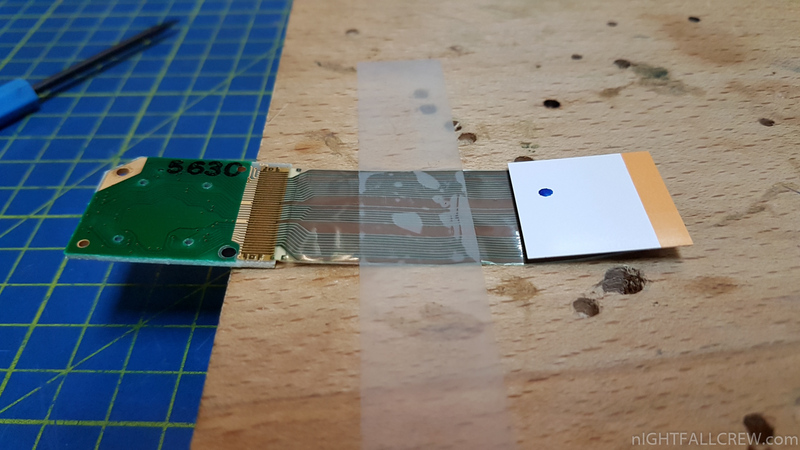 Next i took some graphite in cream (Keypad Fix) to reconstruct the pads on the membrane by simply applying a very fine layer of graphite on the contacts. 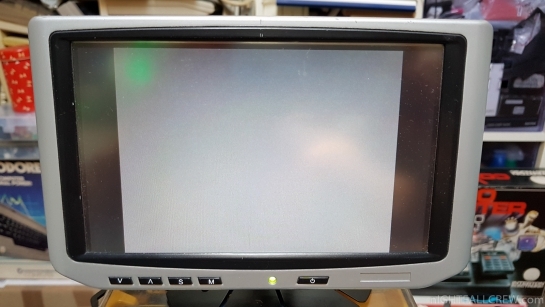 This monitor although fully functional in the video section, was missing audio. 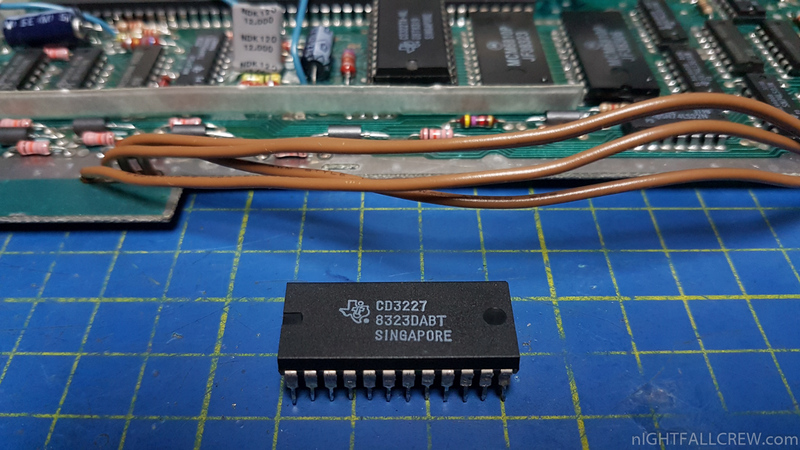 The integrated circuit of amplifying sound (TDA 2611A) was not powered. 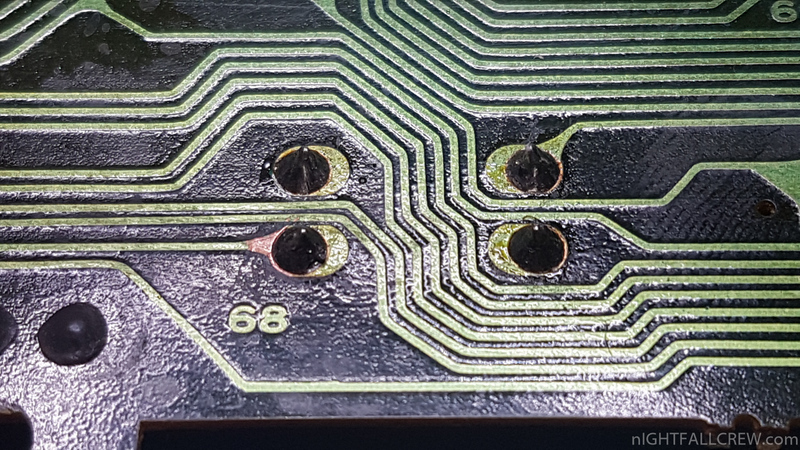 The problem was a broken pcb track (see photo), solved this problem the sound is back. 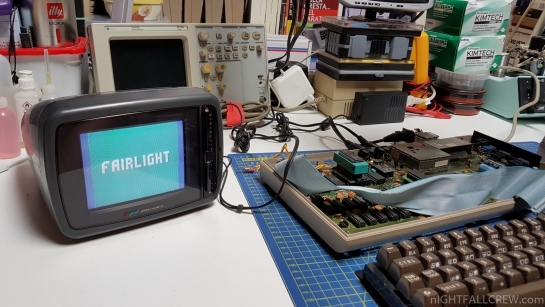 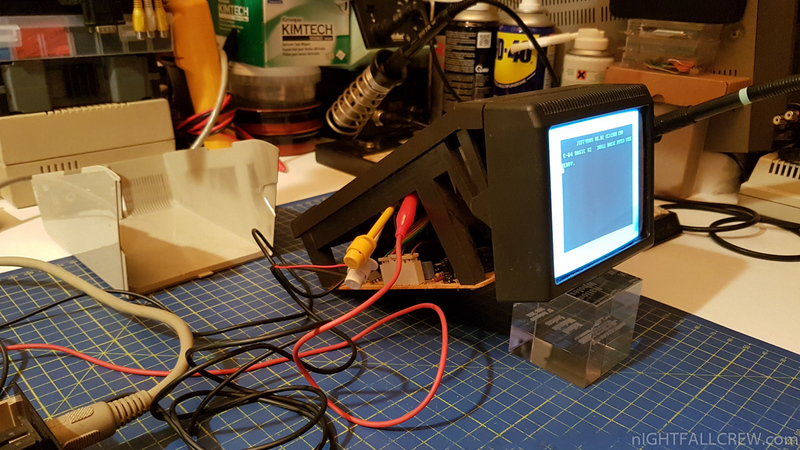 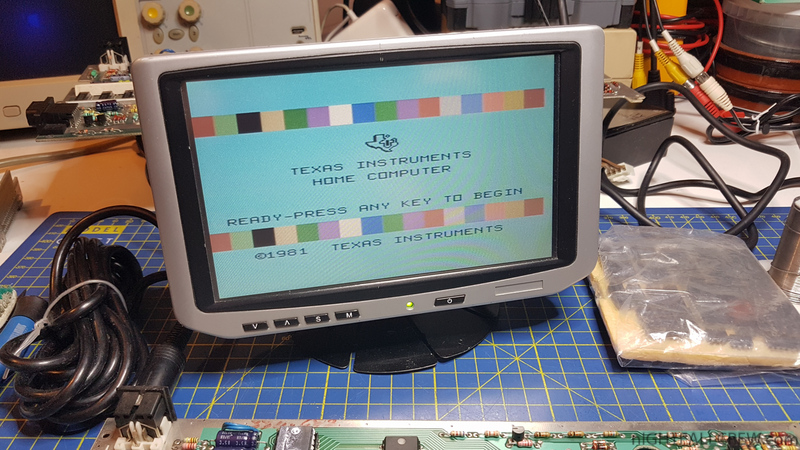 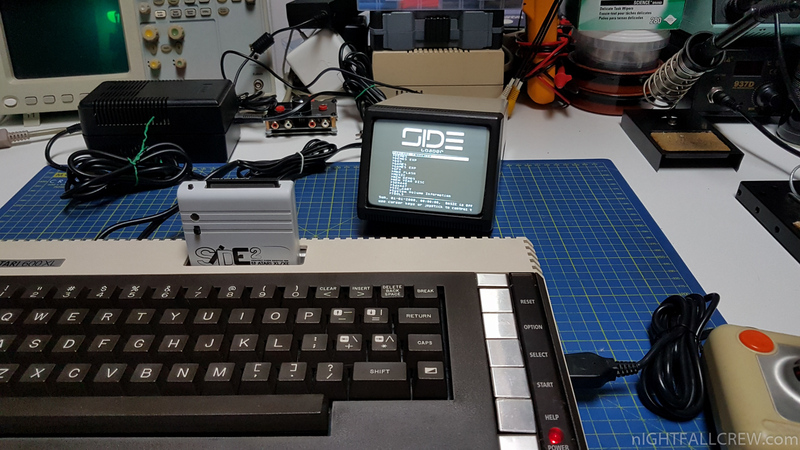 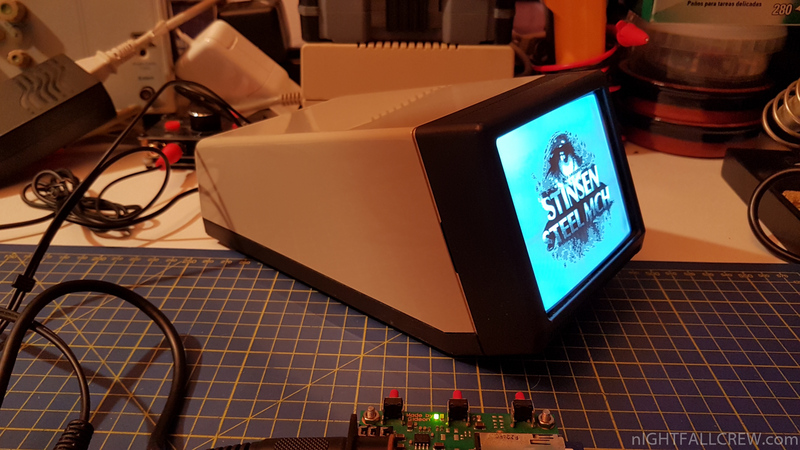 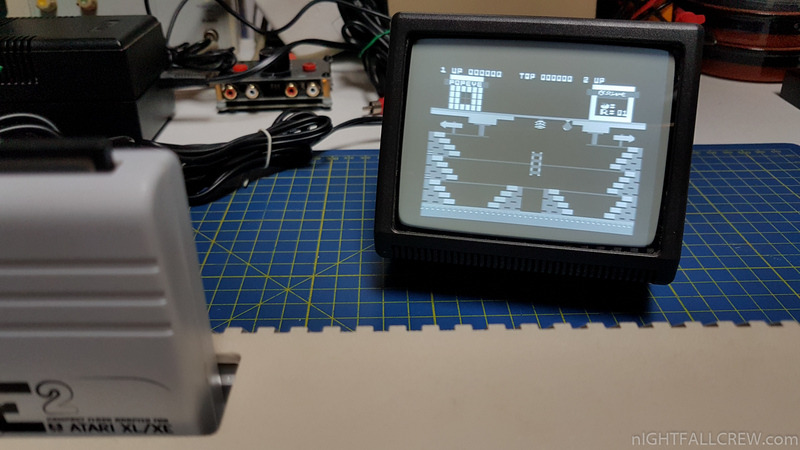 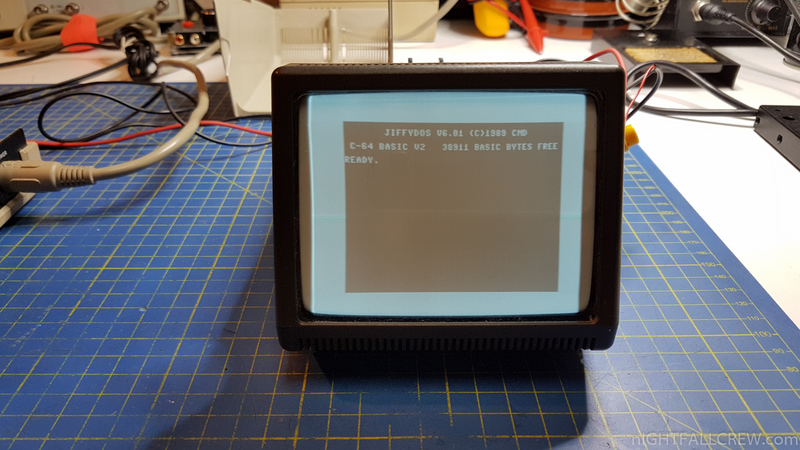 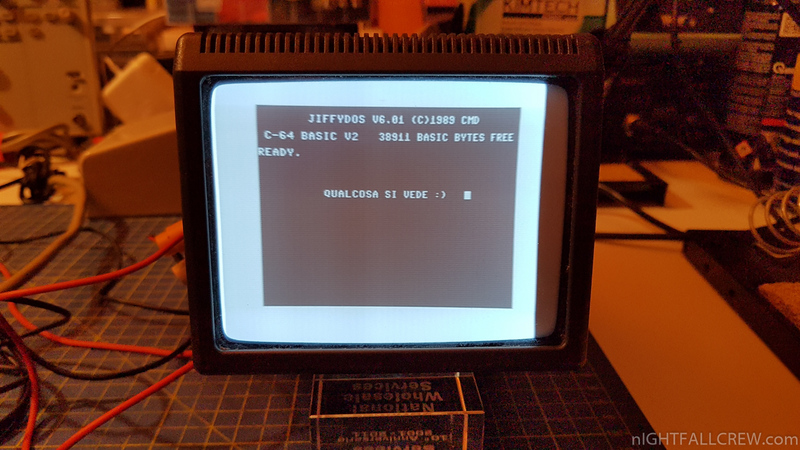 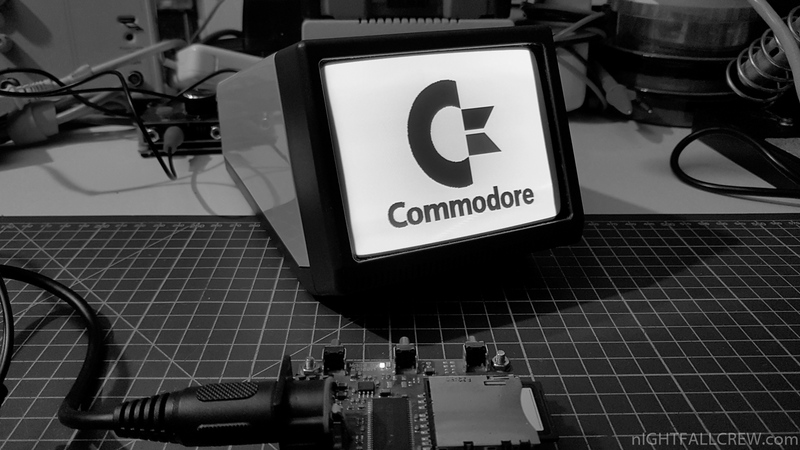 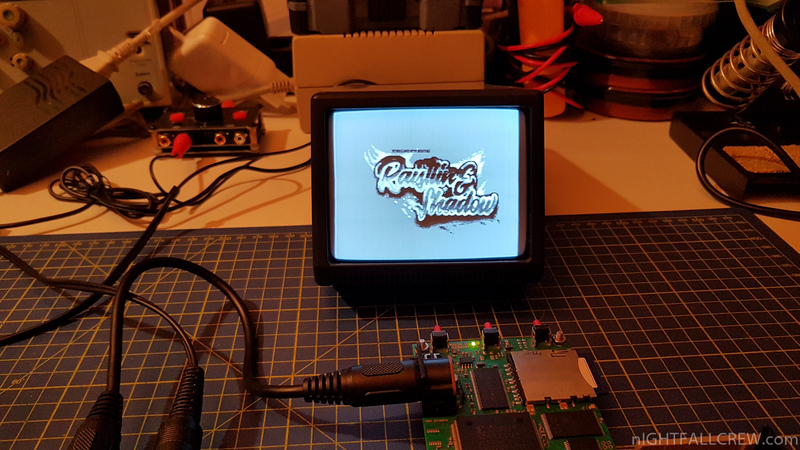 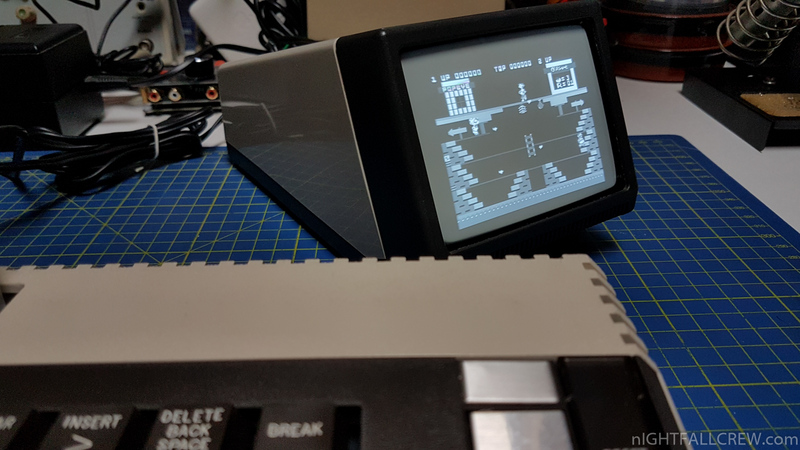 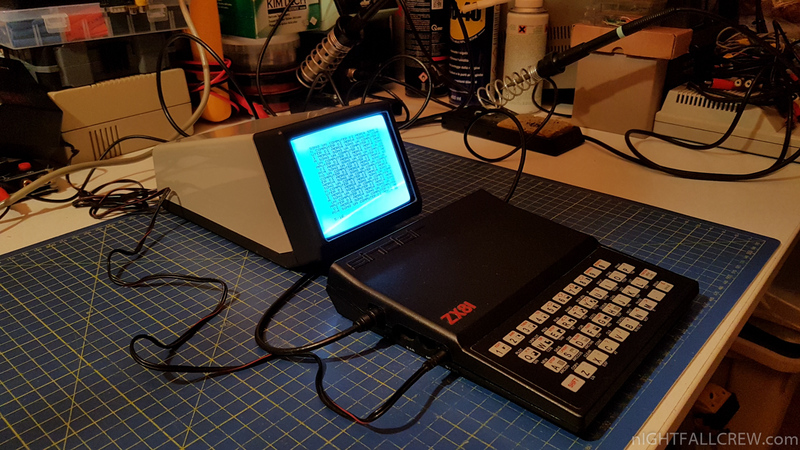 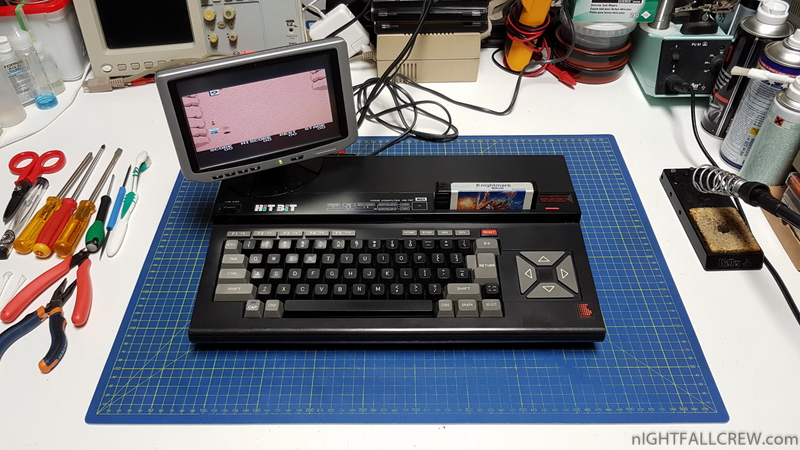 I received this small Black and White CRT monitor from a friend, Ciro Barile of TI-99 Italian User Club, this monitor was used as a video intercom and i didn’t know the power supply voltage, the pinout but especially if it worked. 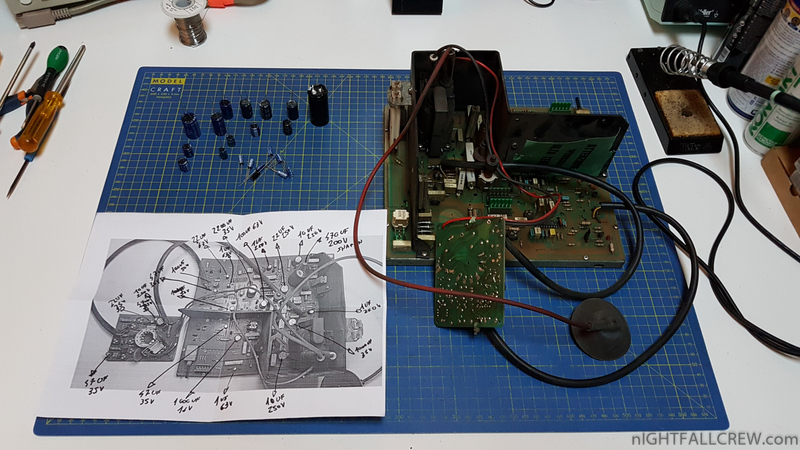 Found the pinout and the power supply voltage i saw the image turned upside down, this because the monitor could be hooked both from top and from bottom, nothing could be easier it was enough to change the deflection yoke connector on the motherboard to flip the image. 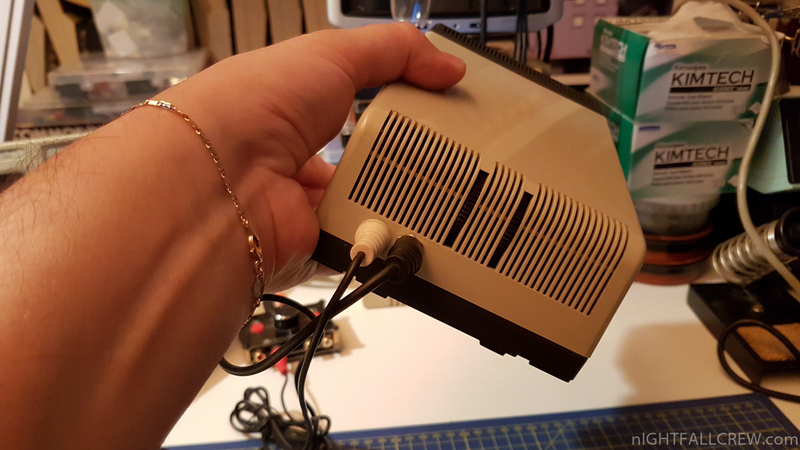 I drilled two holes on the back of the case to facilitate access to the composite video input and power supply (12v 2A). 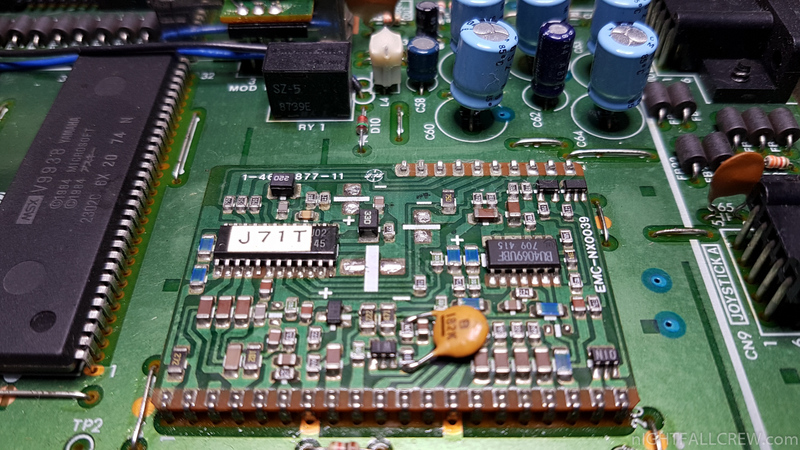 Myarc Geneve 9640 (Replacement filter capacitors and voltage regulators). 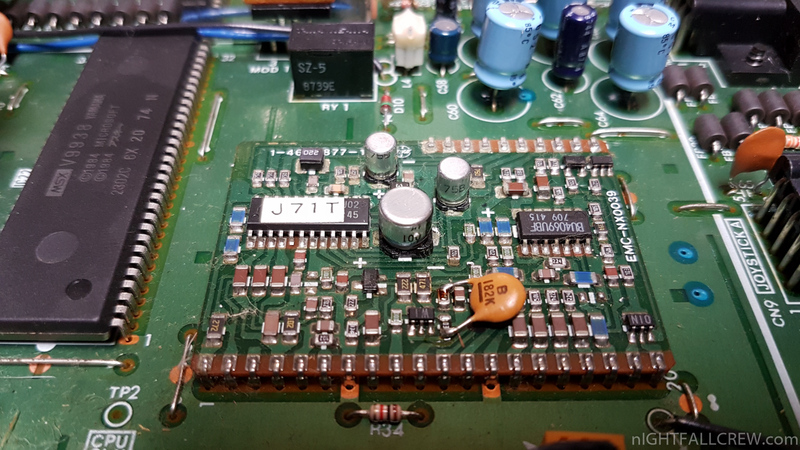 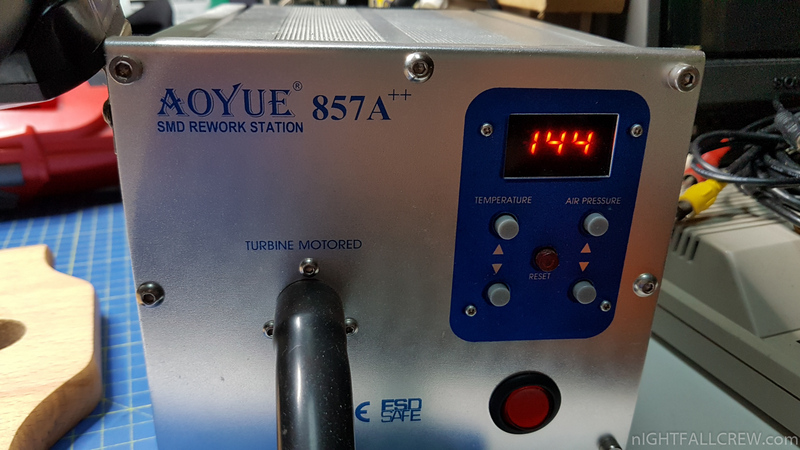 I have replaced all the voltage regulators (7805 / 7812) of 1A with the 1.5A version and all the 22uF / 35v filter capacitors. 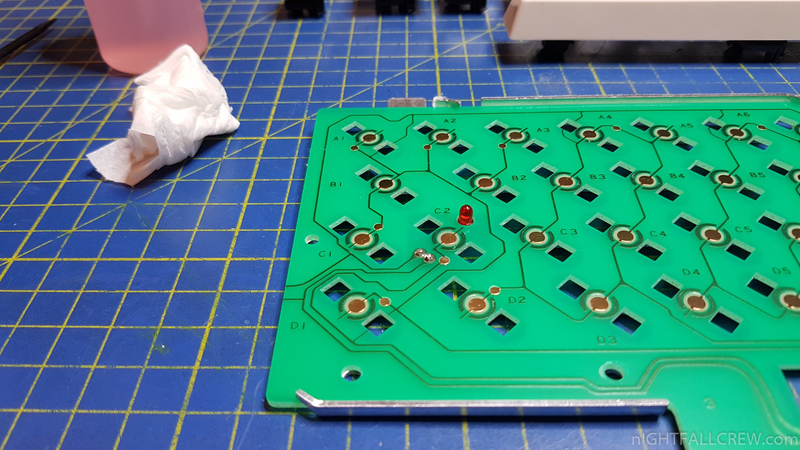 Will also be installed the missing heat sinks in the geneve with plastic case. Mattel Intellivision MOD 5155 (PAL) with GSOD (Grey screen of death) Repair. 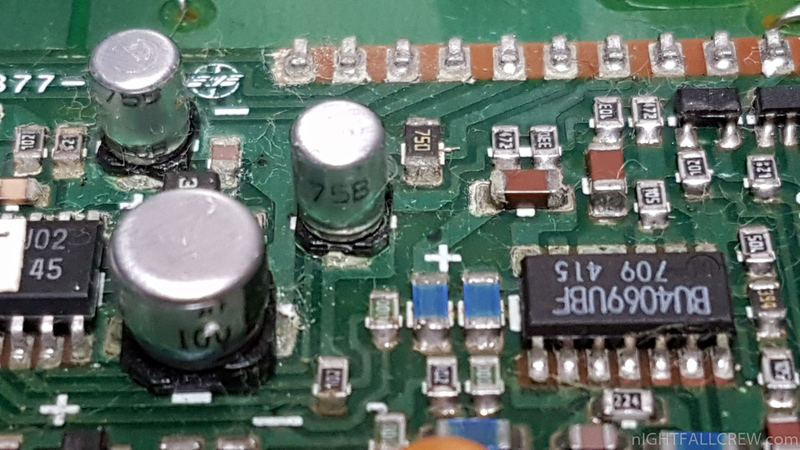 2 x wrong resistors (who has replaced ?!?) of 150 Ohm instead of 300 Ohm. It seems this small Irradio TV/Monitor always suffers from some problem, last time there were short circuits caused by the pressure of the cathode ray tube on the PCB. 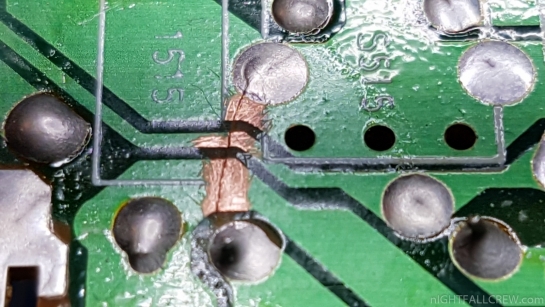 This time some cold joints on the solder pads.it would have been very sad to throw it in the garbage trash. 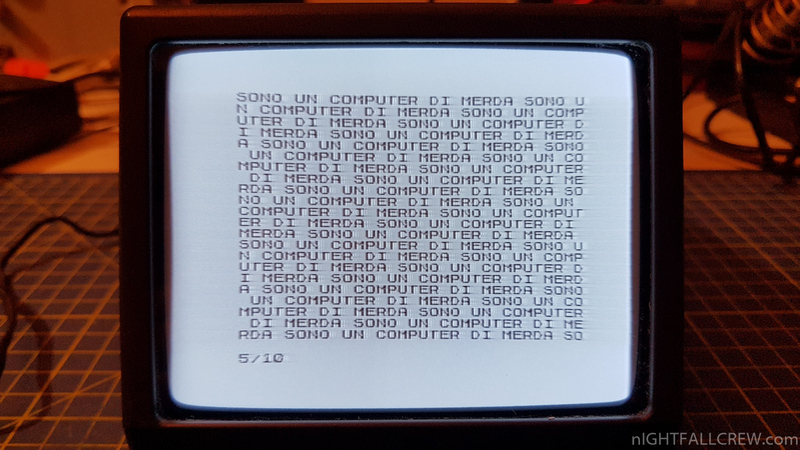 First of all, i thank Andrea Pierdomenico for this fantastic gift. 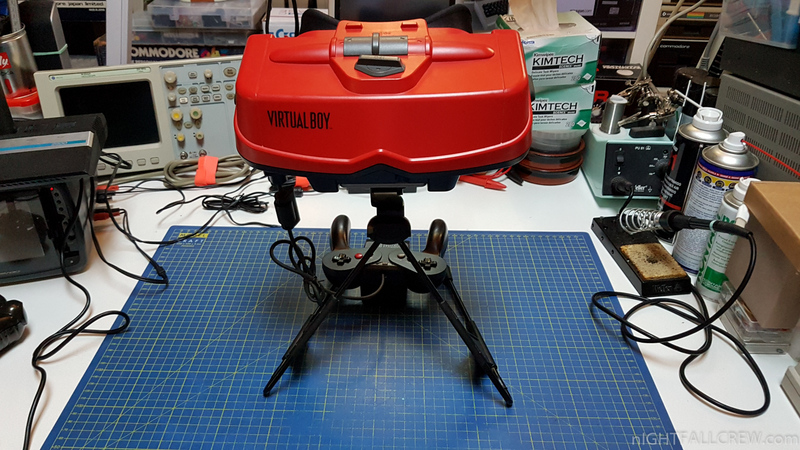 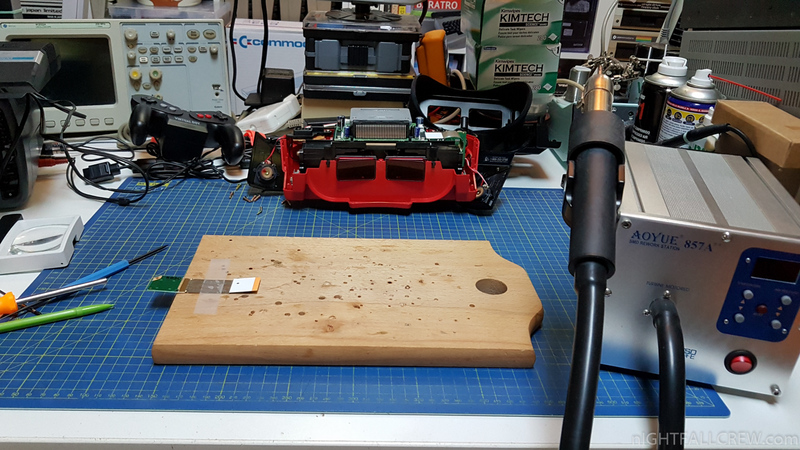 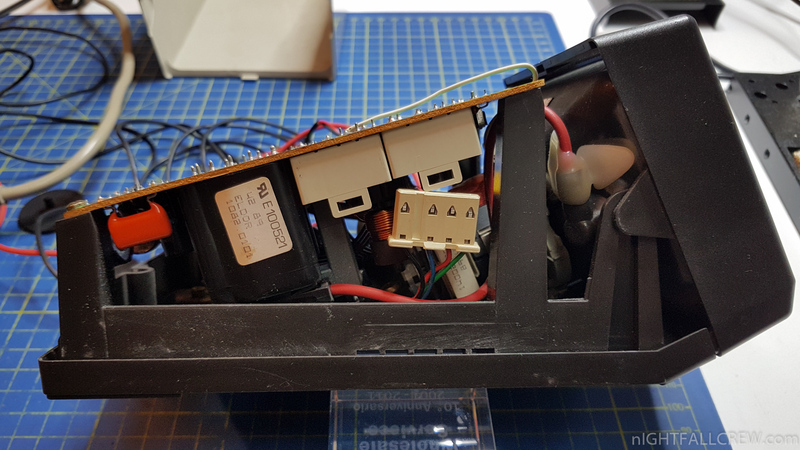 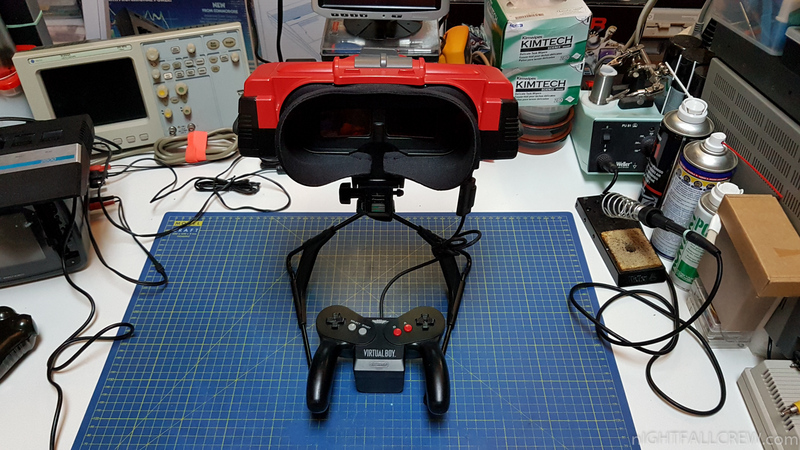 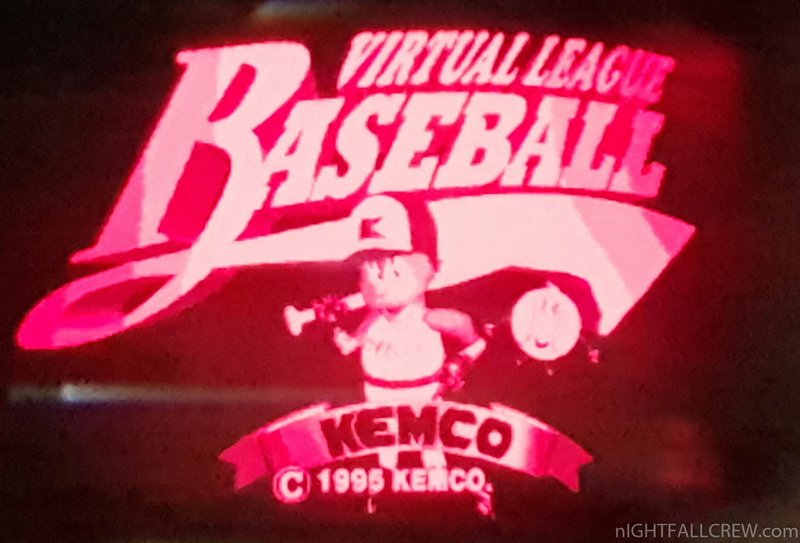 Below i explain how i have repaired the Nintendo Virtual Boy which show the classic display malfunction problems (both). 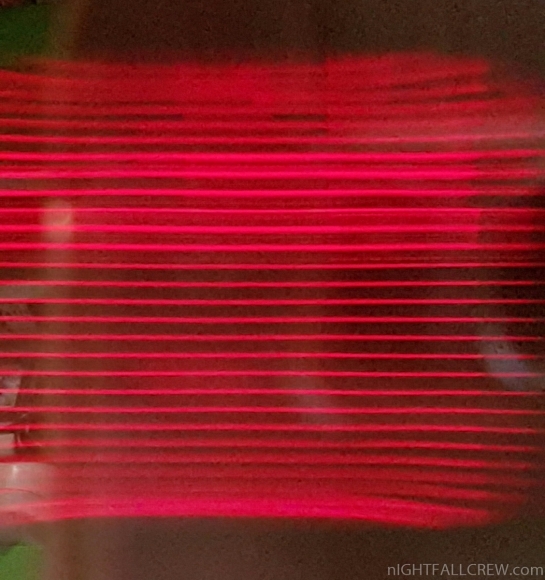 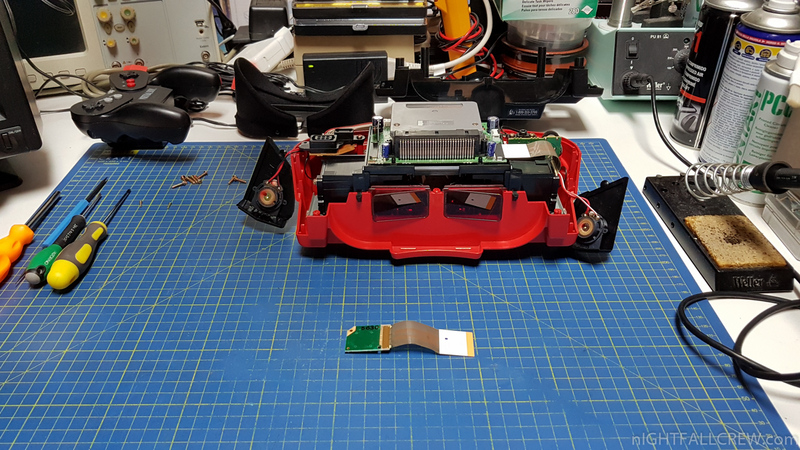 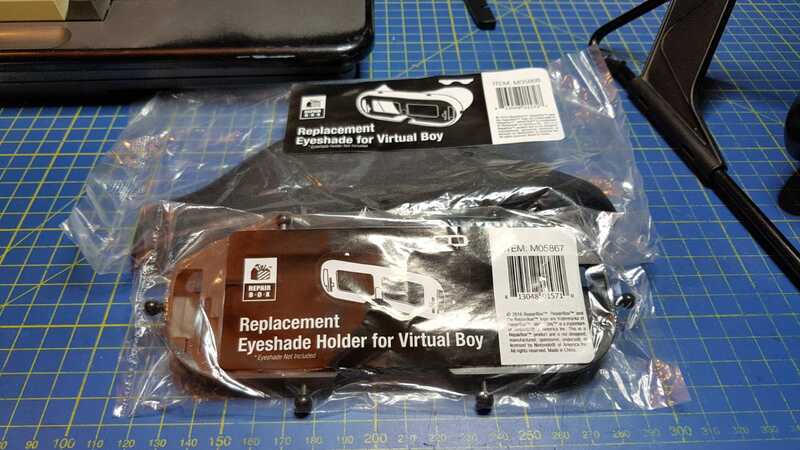 I have used only a pencil eraser and a SMD Rework Station to fix the connections of the ribbon cable to the Display PCB of the Virtual Boy. 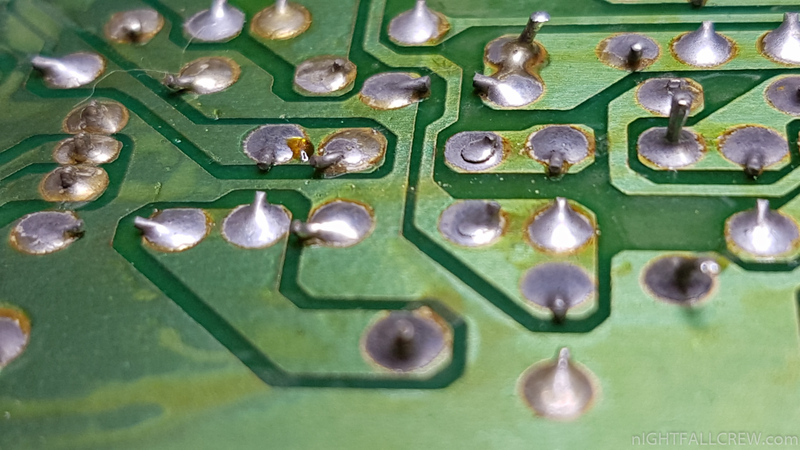 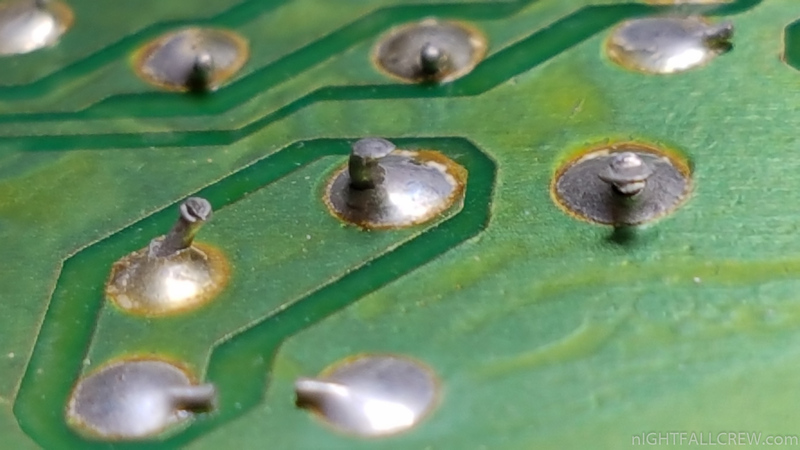 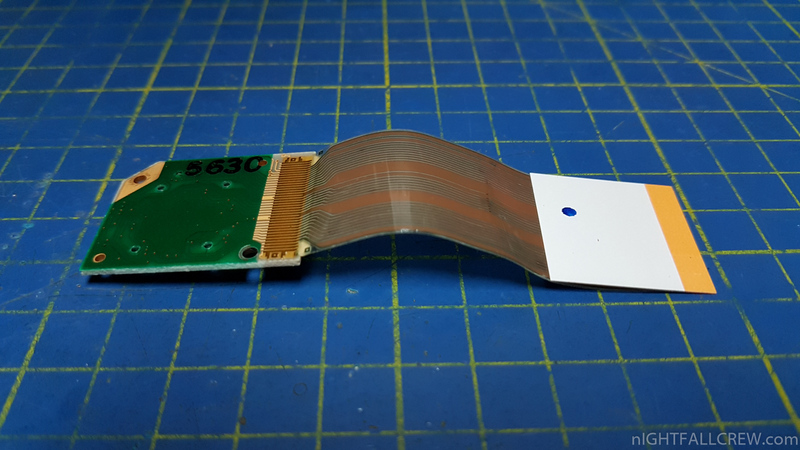 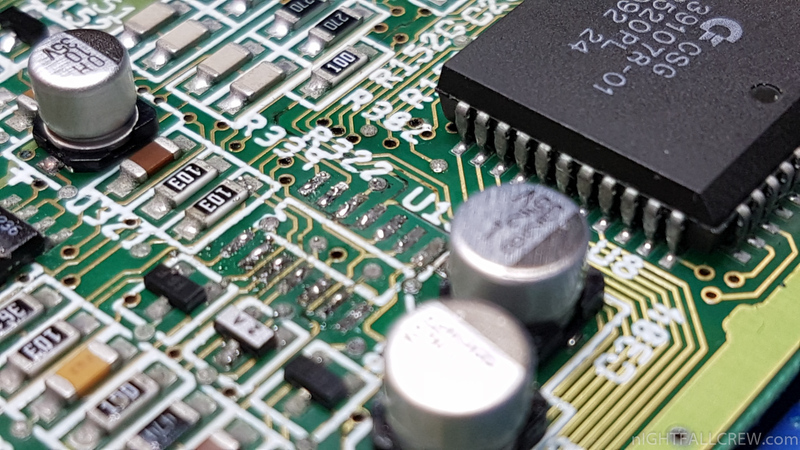 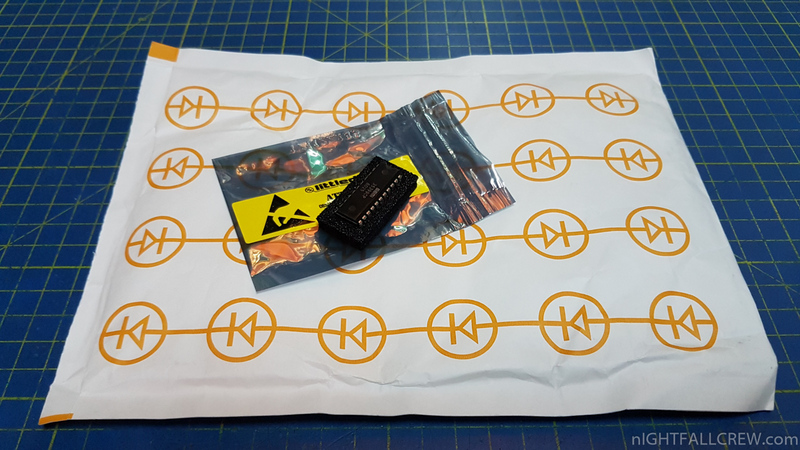 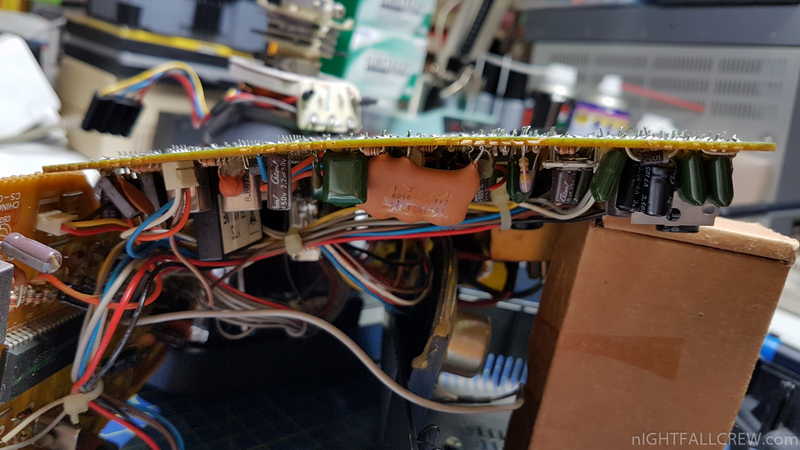 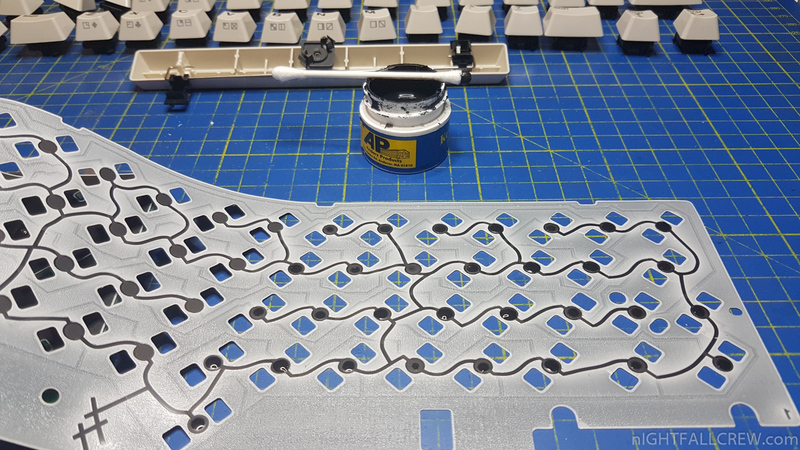 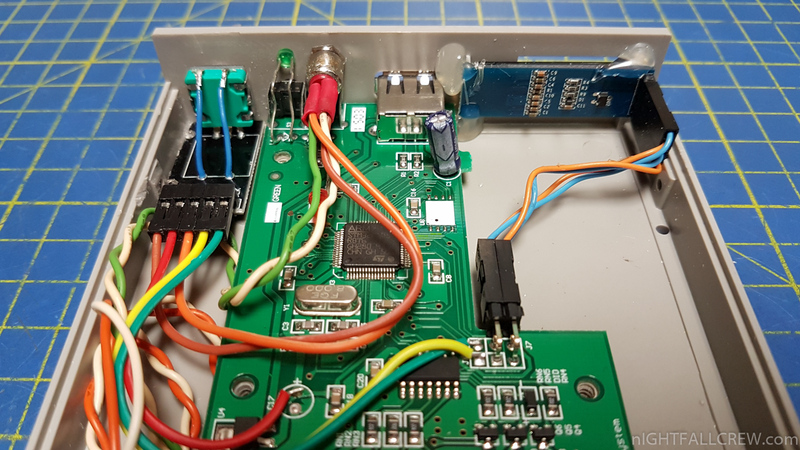 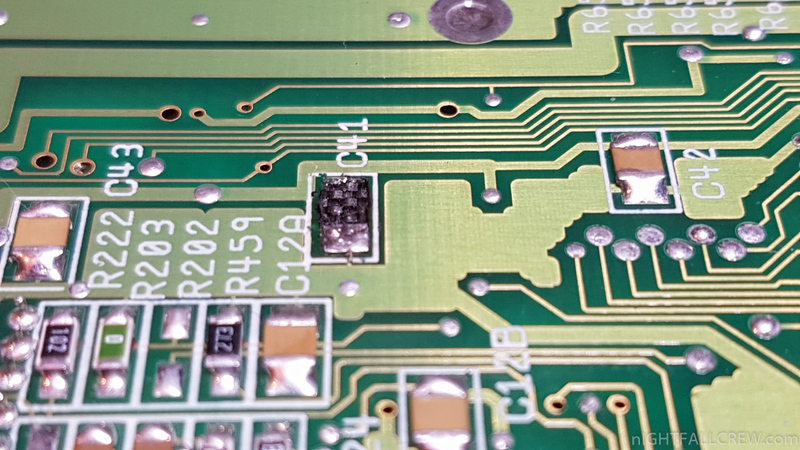 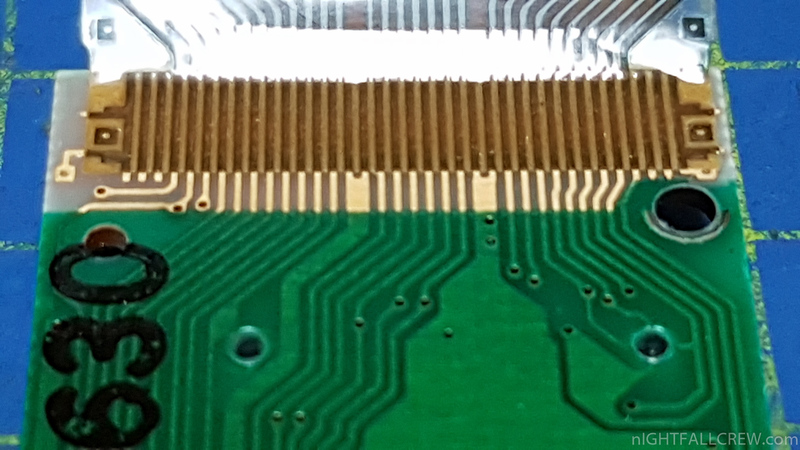 The process involves heating the connection of ribbon cable to the Display and using a pencil eraser to push segments of the ribbon cable to the PCB. 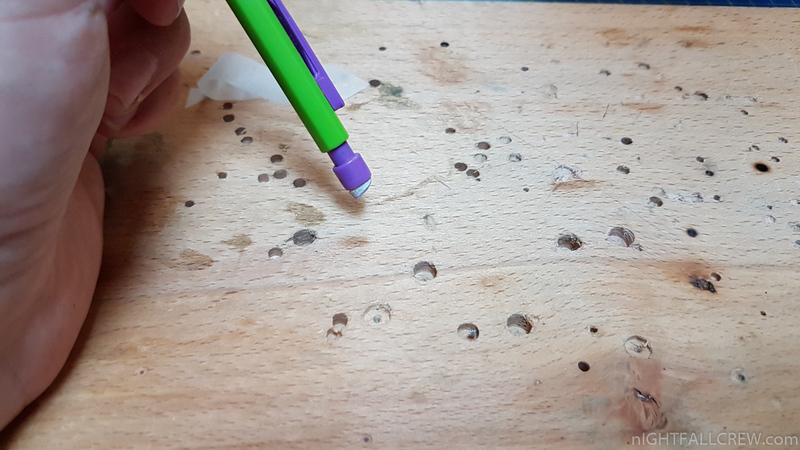 I configured the hot air station to 145 Degrees and 55 of Air Pressure and i made 3 fast transition without ever stopping at a specific point, pressing between one pass and another with the pencil eraser. 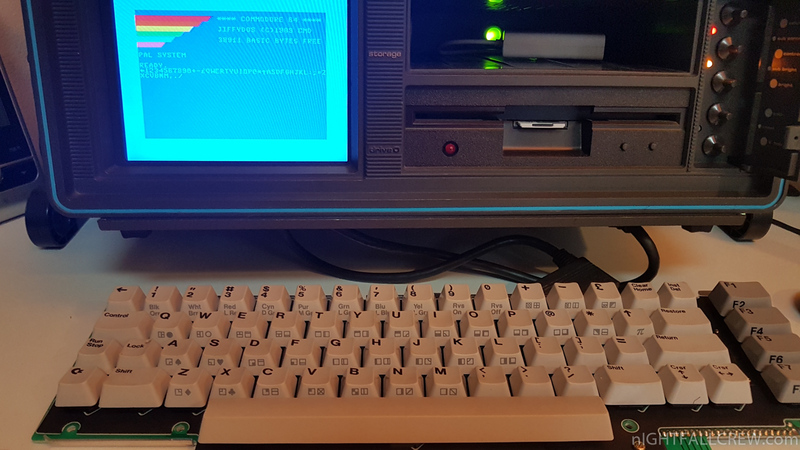 Another Gotek (HXC) with some Enhancements. 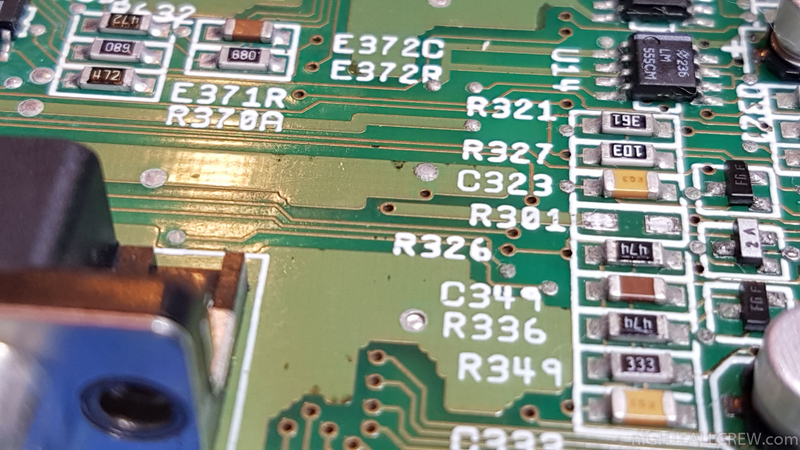 Credits for the best firmware Jean-françois Del Nero. 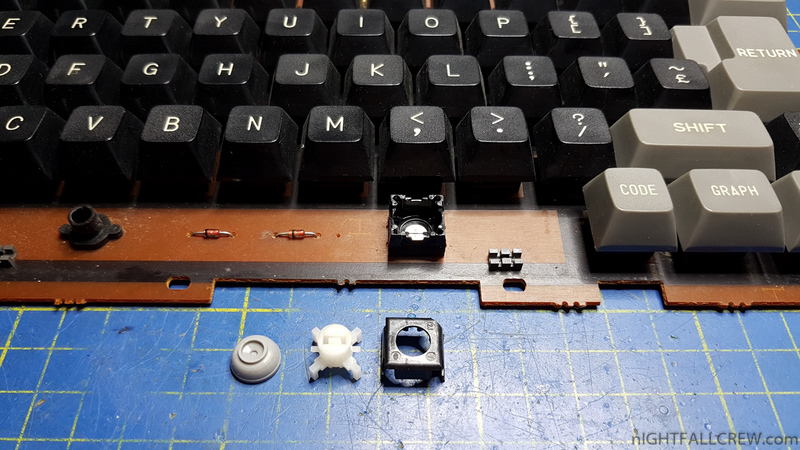 Sony HITBit HB-75P (Keyboard repair). 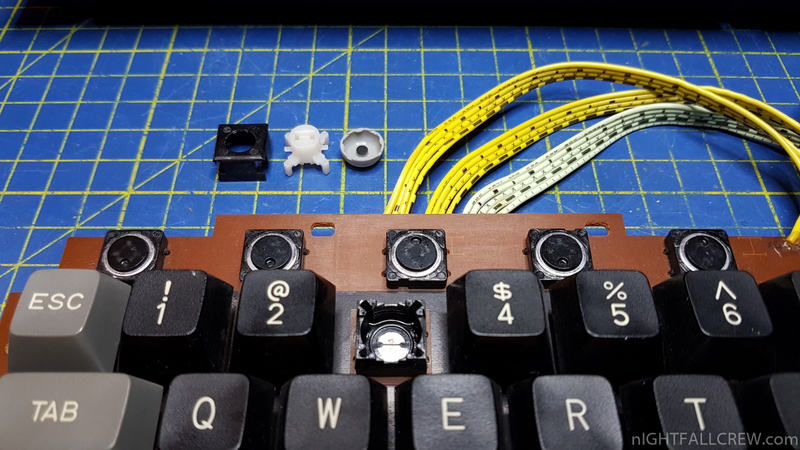 Some keyboard key doesn’t work (3, MINUS, Q, SPACE, CODE [DX]). 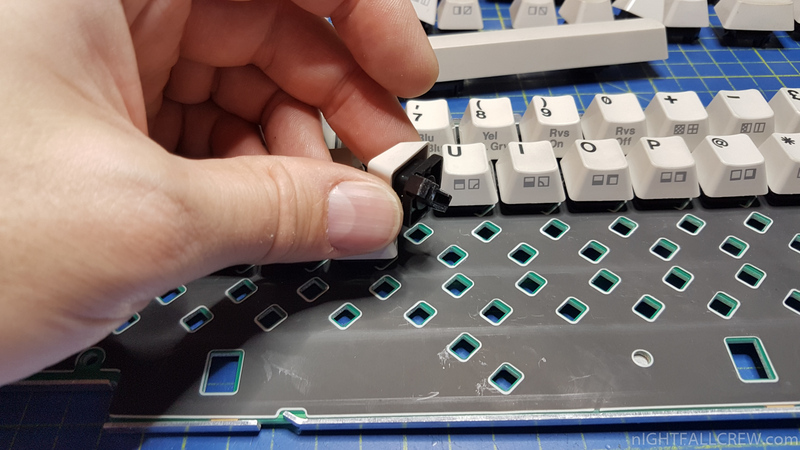 Cleaning the PAD inside the Key Switch. 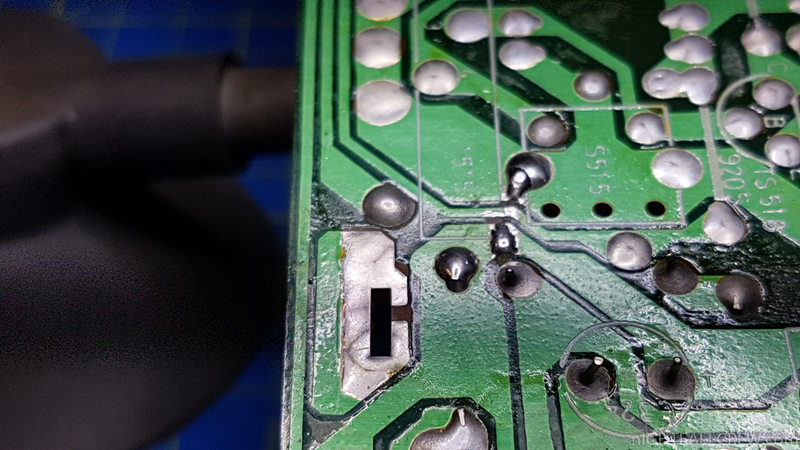 Redone the soldering of the pcb pad (space switch) that was broken at the base. 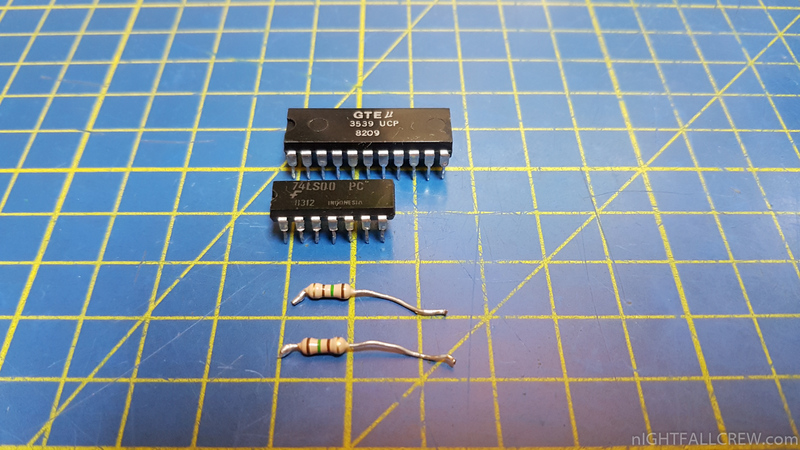 3 x SMD Capacitors. 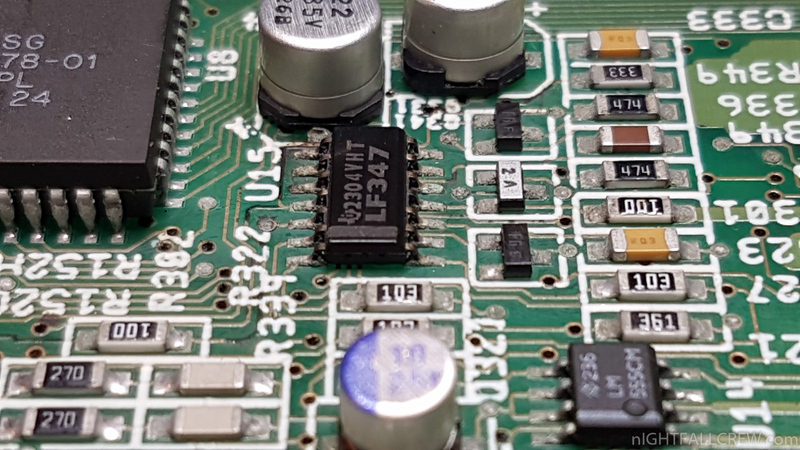 (2 x 10uF – 1 x 100uF) on the Audio/Video Encoder PCB. 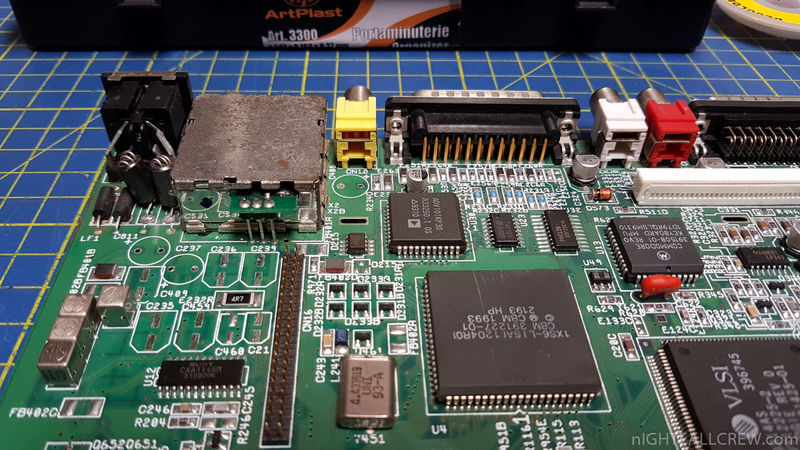 Commodore Amiga 1200 Sostiuzione Condensatori. 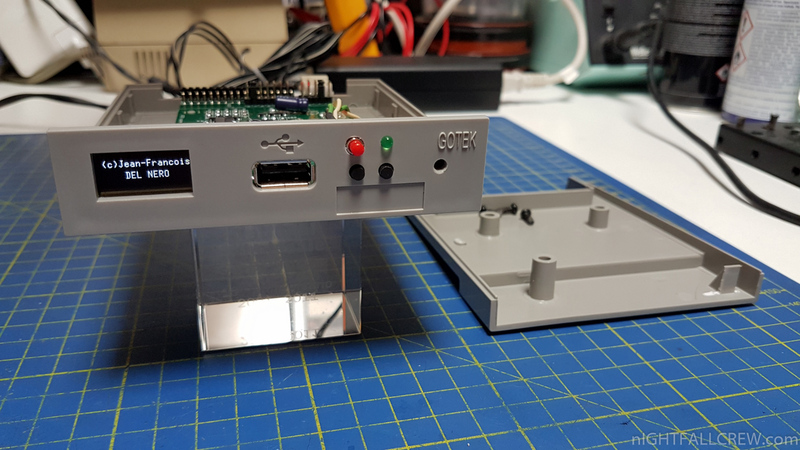 Hantarex PCB Coin-OP Monitor Full Recap.